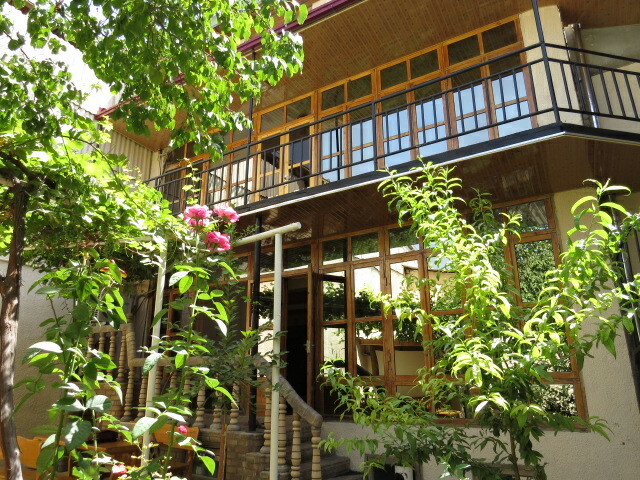 This morning we were off to the Mongolian Embassy to lodge our visa applications. We were greeted by light snow on the walk over and I can tell you that was refreshing. We entered a small room and prepared our paperwork with around 10 Chinese hopefuls, I’ll never understand the inability to queue that seems to afflict many other nationalities around the world. Anyway with elbows spread we finally made it the front of the line and our applications were lodged with a solemn faced unhelpful individual. Pickup would be after 5pm! The day was spent sourcing a supermarket for a re-supply. This was followed by a lazy day with coffee’s and lunch. 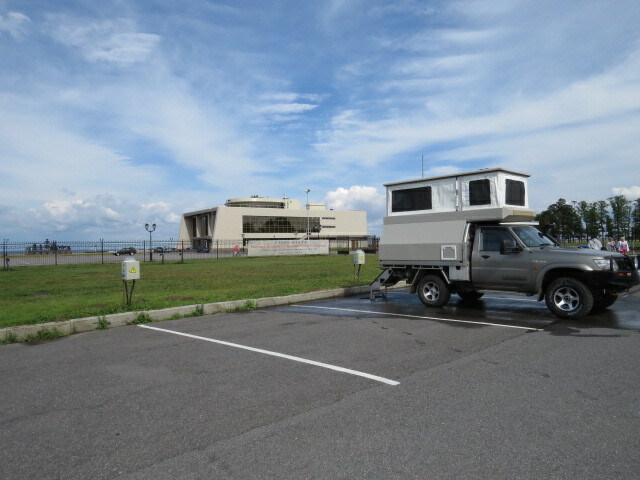 We retrieved the Patrol from the hotel’s secure parking later in the afternoon and headed to the Embassy. 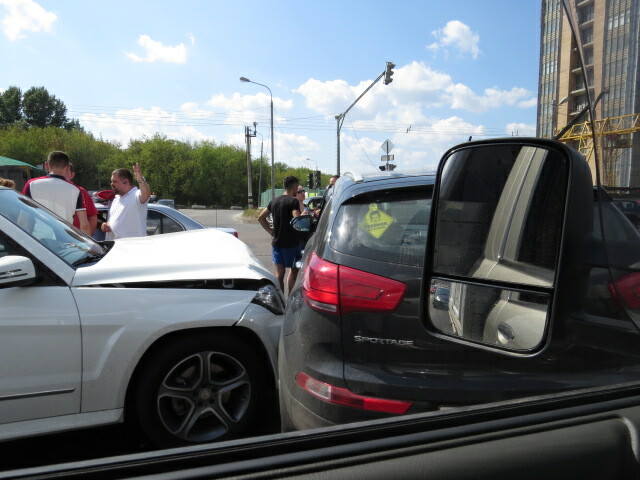 A Lada sedan promptly approached and it’s occupants gestured that they would like to look at the vehicle! So a tour ensued with lots of hand gestures and head nodding. Upon looking in the cab and noticing the tablet a hand was pointed skyward and “Ahhh Sputnik” was announced – Yep we are using GPS! Visa’s in hand, we headed south for the border along slowly rising topography that ended up just at the base of the snowline. We found a campsite amongst pine trees around 45km from the border and it was freezing. I had the Webasto heater on before I popped the roof …. We had heard many stories about the border – that we should allow a minimum of 4 hours and be there before opening to secure a spot in the queue. Although prepared for this we really don’t like early starts and decided that as camp the previous night had been a late one we would get to the border when we were ready and whatever would be would be. So at 11:30am we entered the border control area and there was no queue. We spent some time with very confused officials whilst they made phone calls and tried to work out what to do. After mirrors under the car, a sniffer dog, opening every compartment and popping the roof up we were cleared for the next stage. Fortunately we found a customs officer whom had a little English and he assisted us with the paperwork. 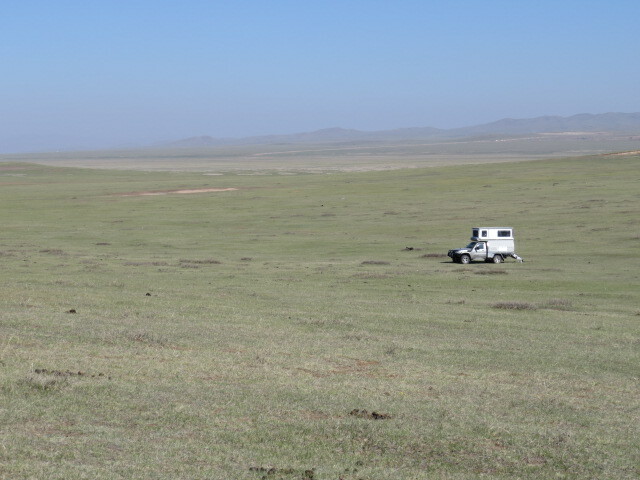 Anyway an hour and a half later we found ourselves in Mongolia with third party car insurance and a new Mongolian SIM card. I don’t know if we were lucky or if arriving after the queue had cleared assisted our passage but it was quite painless. We will see how this approach works next time. South toward Ulaanbaatar includes quite a few tolls, generally around 500 tŏgrŏgs each! Given 1600 tŏgrŏgs to the Australian dollar, it doesn’t really hurt but it was hard to work out why we were paying a toll for non-existent road maintenance. Apparently however the toll is income for the towns along the road. Lunch was spent on a grassy rise with the pleasant fragrance of thyme. It seems to be growing wild everywhere at the moment and can be quite intoxicating. Closer to UB and we were getting a little desperate for a campsite as I didn’t think tackling the anticipated heavy traffic at night was an overly bright idea. Fortunately at around 30km out we managed to wander over a small rise and found a spot on a hillside out of view from the highway that would suffice. Upon parking we noticed quite a few headstones around the area and figured we had inadvertently found the dead centre of the locality! Very cold overnight and quite a dosing of snow meant for a cold start in the morning. We were headed for the Oasis Café & Guest House, which has become a favourite amongst overland travellers and motorcyclists alike. I think you would have to experience driving here to understand how reckless it is! We spent the afternoon cleaning the camper and servicing the Patrol and found ourselves partaking of the drinks fridge more often than I’ll admit if asked directly. 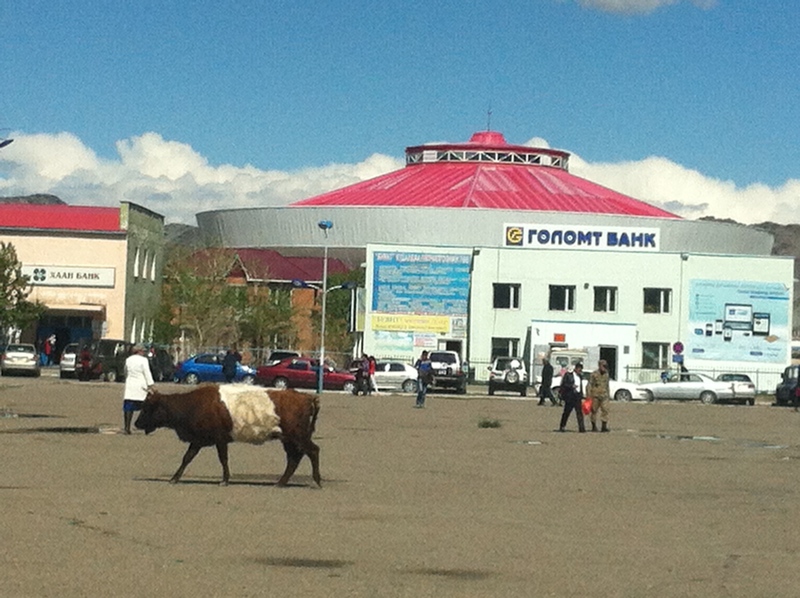 Next day we braved the local bus and headed the 5kms into UB centre. The bus journey is basically an aerobic workout – stand sideways to the direction of travel is rule number 1. Your driver is an idiot and not at all aware of the fact he has passengers onboard so you will be thrown around as if you are inside a pinball machine. At one point a tumbling toddler flew past us down the aisle whilst the bus was under maximum braking with horn engaged and steering wheel being yanked side to side. I must admit I found it rather amusing to watch the local punters just accept it because that’s how it is! Sukhbaatar Square in the centre of the city is a nice area to relax for a while and people watch. 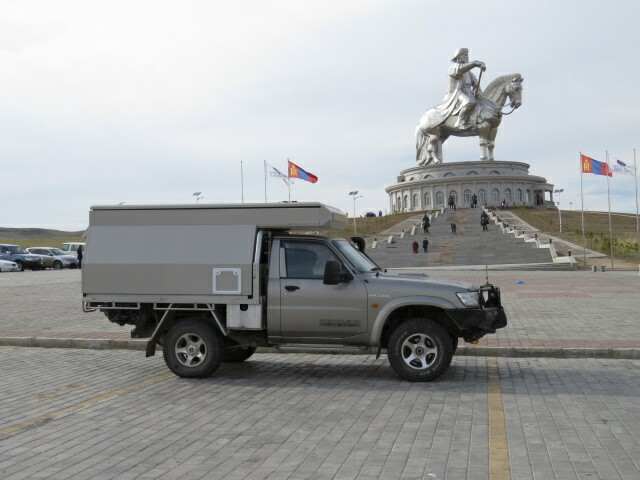 The obligatory photos of the Chinggis Khan Monument in front of Parliament were taken and then it was off to the Museum of Natural History. We wanted to see some of the apparently amazing dinosaur skeletons and the like on display. 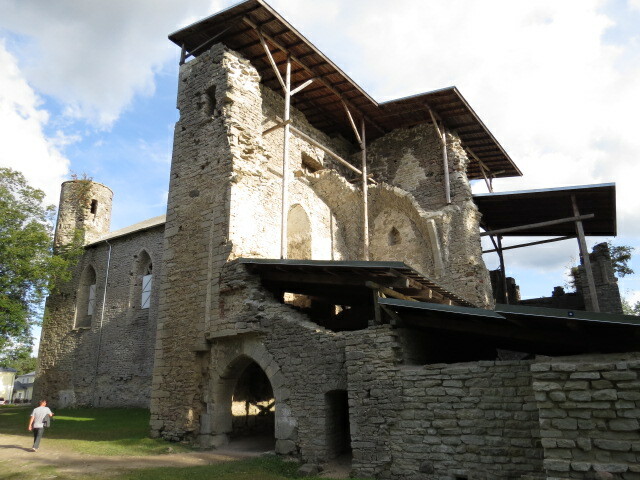 Alas the building is closed until structural repairs are completed. Looking at the building we will have a colony on the moon before that happens. 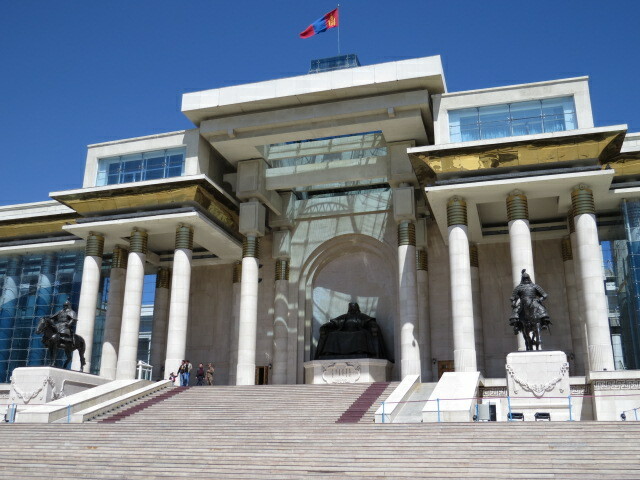 Off to the Museum of Mongolian History instead as it holds a great collection of early Mongol armour and the like. A couple of hours were enough so again coffee and the day disappeared in earnest. 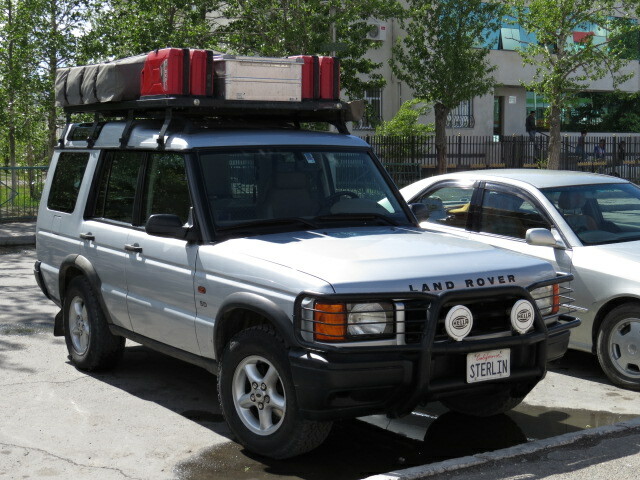 We were apparently the first international vehicle of the season to arrive at the guesthouse but only by a day as a Land Rover 110 with English registration was in the parking lot upon our return from the city. We spent some time perusing maps with Craig and Klaus and discussing route options. If your feeling like an Internet search then you can find them under Bermuda Rover. 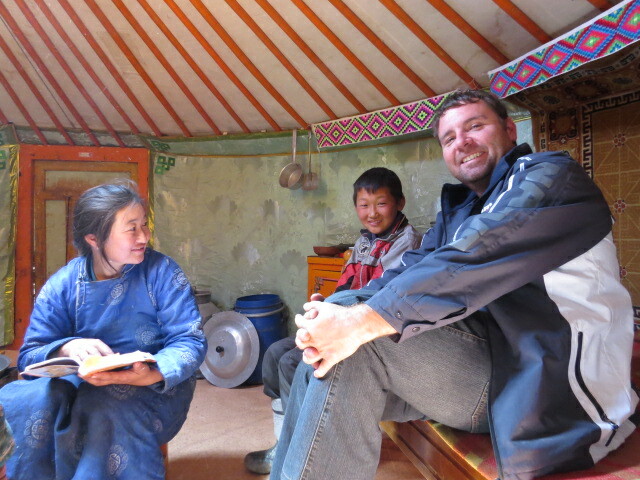 We checked out and headed off to Mongolian Immigration to extend our visas for by a week. 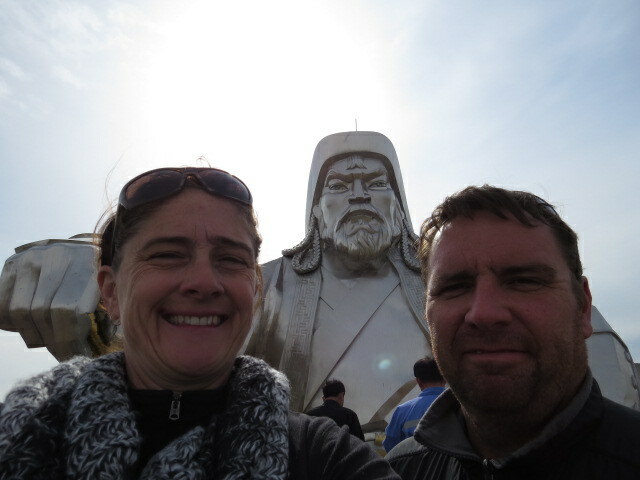 The process completed we headed to the State Department Store in central UB and stocked up before heading east to gaze upon a relatively new shiny monument of Chinggis Khan on his horse pointing toward China that is some 40m high! 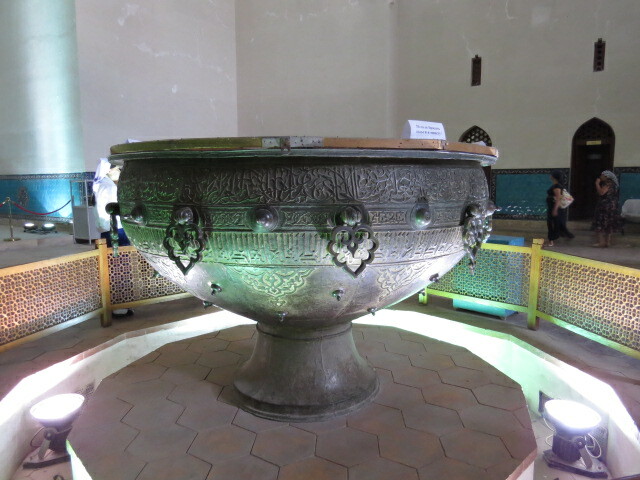 It was worth a look and was a very impressive monument. 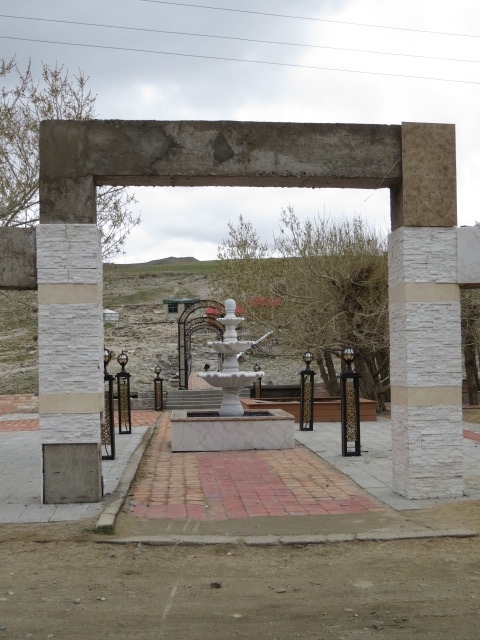 It’s fortunate Mongolians have Chinggis Khan as without his legacy there would be a lot more vacant land to fill that is currently occupied with the many and varied monuments immortalizing him. 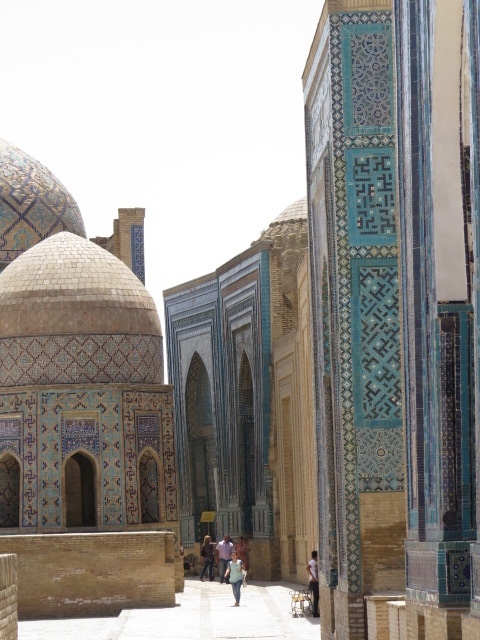 The idea was to continue southeast and then cut southwest through some small villages and intersect the road from UB south to Dalanzadgad. 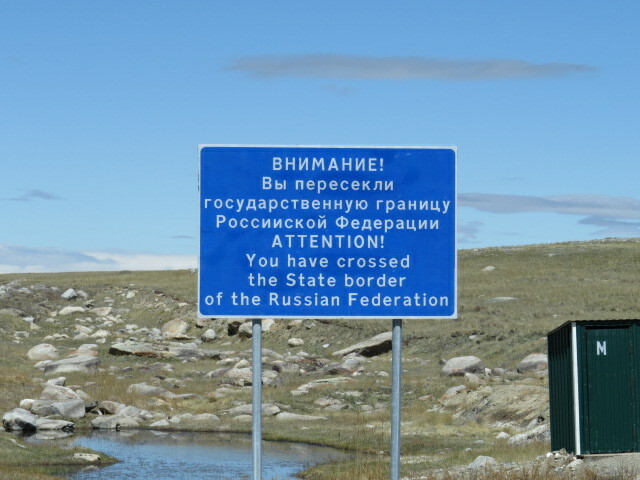 A terrific idea in principle but it totally went to custard when trying to cross the Trans Mongolian Railway line that was preventing our escape. Eventually we asked at a Police checkpoint where we could cross and were given directions – pretty happy with that we headed off! They didn’t mention there is only one crossing in the area which happens to be an underpass and that a corolla with a roof rack is all that’s going under there! Anyway, we’d well had enough by now and although we probably could have persisted we made the call to head back the 100kms to UB and pick up the road south from there. Well that wasn’t so easy either as there is a massive amount of road works and infrastructure construction being undertaken around UB and navigating the maze of unsigned dirt roads and diversions whilst trying to avoiding having the Patrol written off by a flying corolla made the task very time consuming. 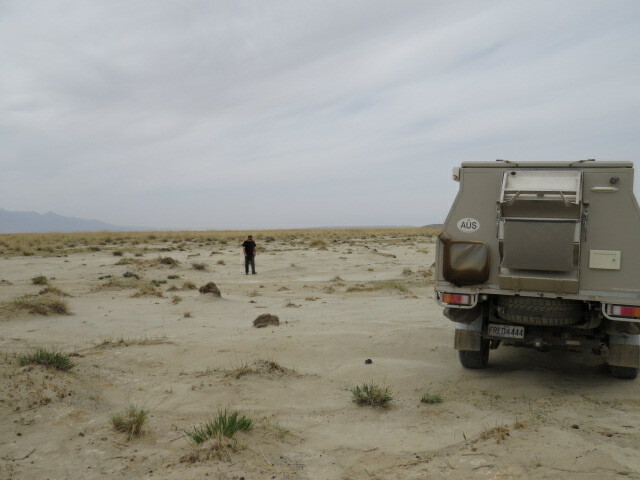 However when in Mongolia enter a GPS waypoint and go that way! It was well and truly dark by the time we were able to confirm we had indeed positioned ourselves where we wanted to be. 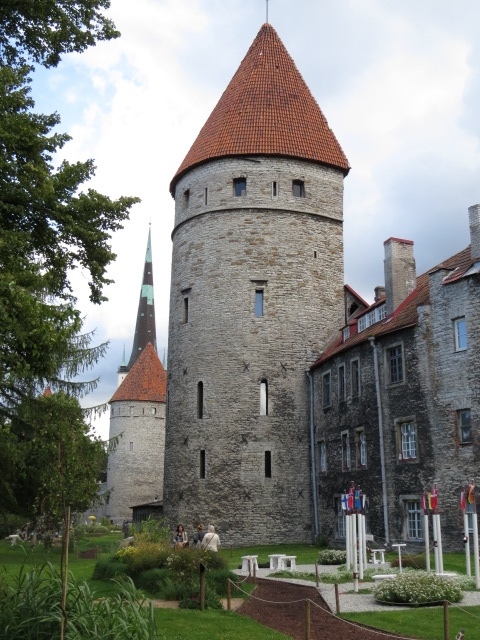 Having NARVA onboard at this point was something I was very grateful for! 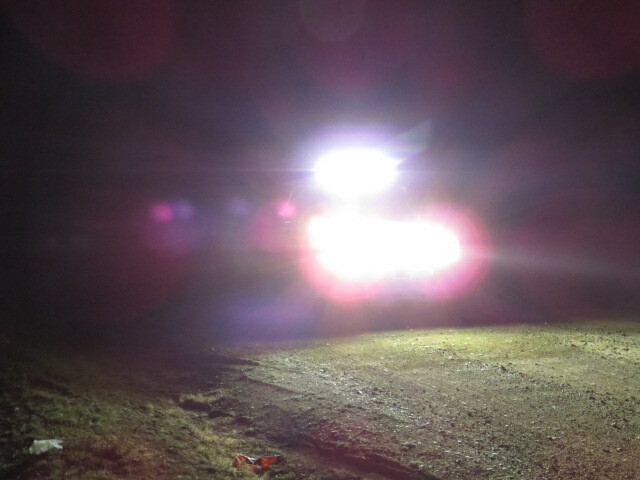 Being able to light up the terrain and tracks ahead absolutely reduced the tension in the cab. Eventually we darted off the track and over a rise and were ready to enjoy a cold beverage. 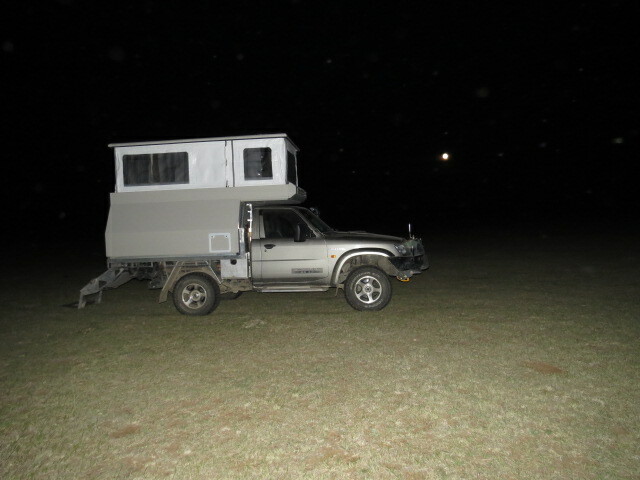 I turned off the Patrol and opened the door and there in the distance about 100m away I could just see a ger in the slight moonlight. 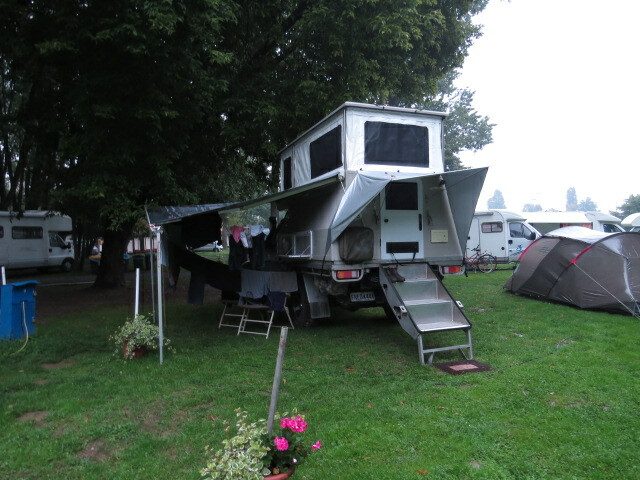 Probably a good thing that it hadn’t received a burst of our lights as the poor occupants would have had welding flash! I now realize some weeks later that ger’s are just about everywhere! Anyway we moved a little further and that was home for the night! 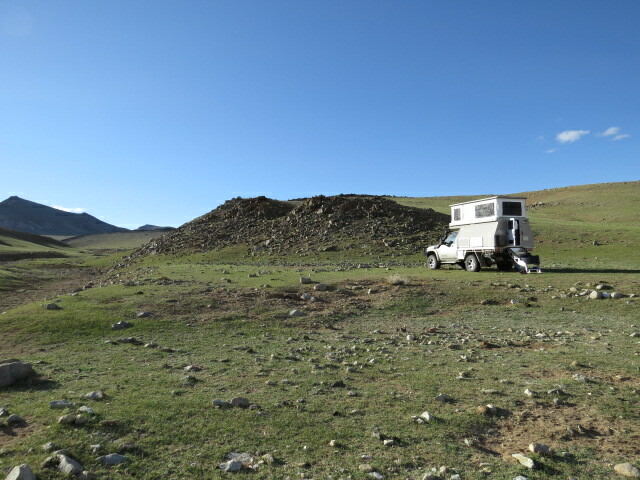 Next day we headed across the grassy slopes toward Baga Gazryn Chuluu Reserve and were rewarded with lovely granite outcrops mixed with grassy valleys. 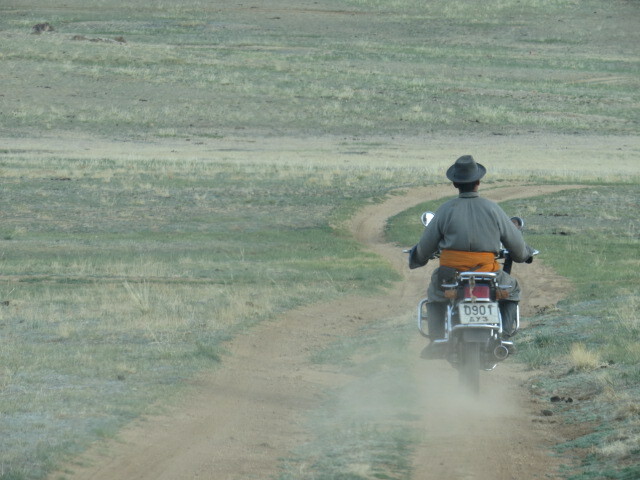 After a little exploration we suddenly had a motorbike following us at a safe distance, never really getting too close. 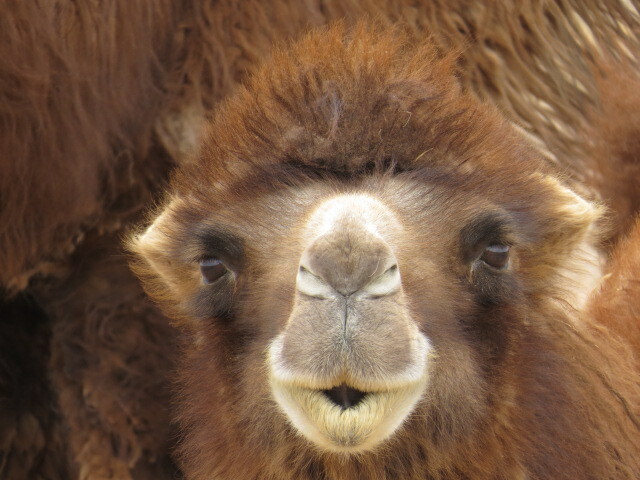 Here we go I figured – “you want stay in ger?” or “you want camel ride?” At an opportune moment the bike closed and to our surprise a Park Ranger greeted us. He took the opportunity to guide us forward in the direction that we’d been travelling and made sure that we saw the 2 main sights in the park. A small cave was first and then an old Monastery in a lovely gorge that had been destroyed by the Russian Communists in the 1930’s. They were having a little purge of Mongolia’s free thinkers and reduced the population by a few percent just to get everyone on the same page!! 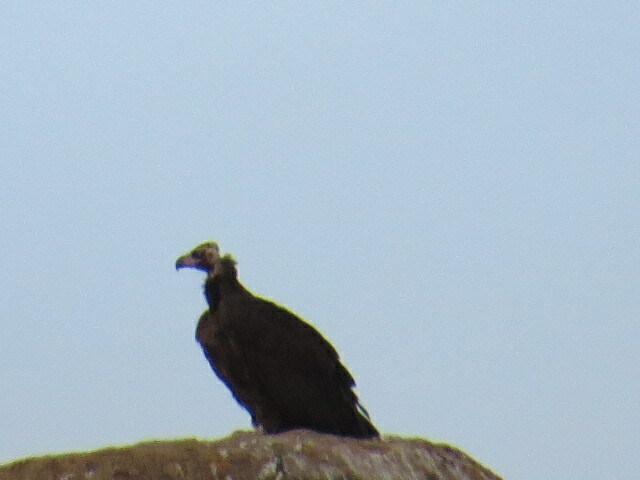 We spent the evening watching a pair of massive vultures attend to their nest and woke the following day to heavy and consistent rain. 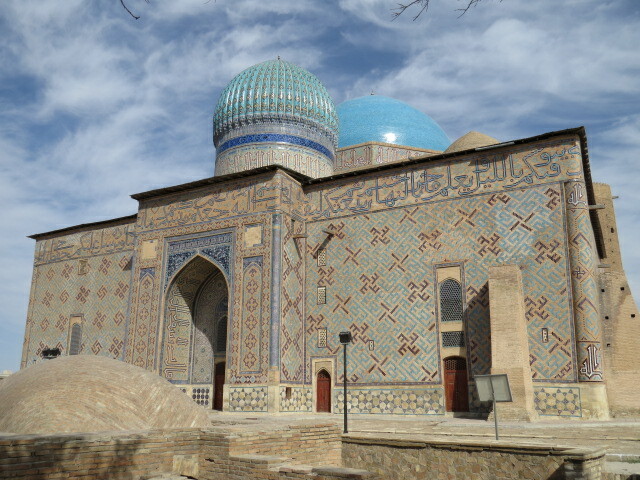 Back to the highway and south to Dalanzadgad. Heading south along the black top is always a test in this country with nice smooth road followed by unmarked holes the size of refrigerators. 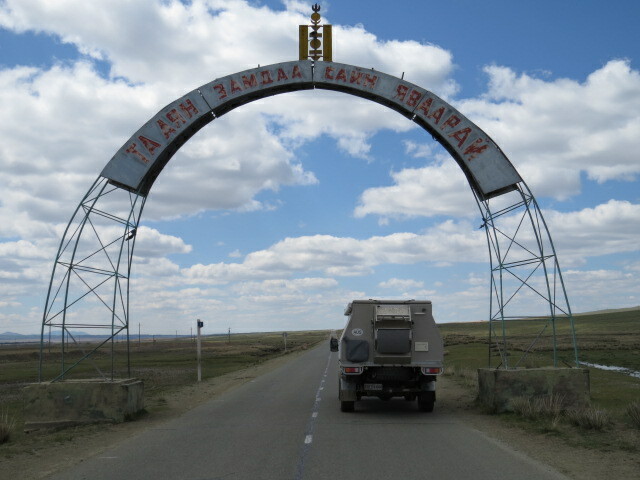 Fortunately we only travel at around 80 to 90 km/h and I was thankful for that as I rounded a sharp curve on the highway and was met with a wall of dirt about 5 feet high across the road – the Mongolian way of closing a road! 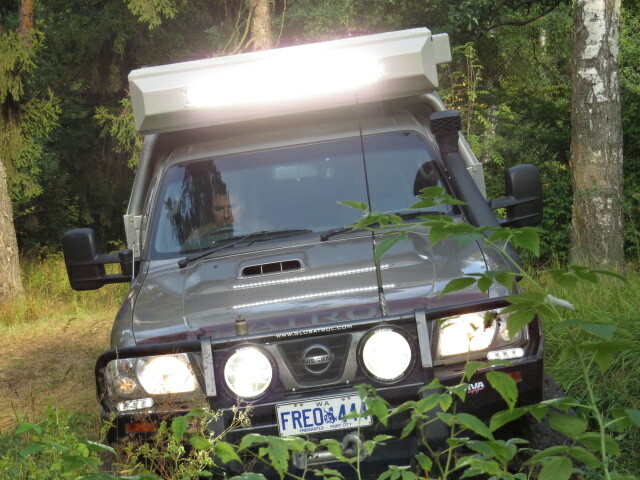 I had to wonder how the Land Cruisers that passed me just moments earlier at well above 140km’s an hour had gotten on. I guess they either know the road or go Dukes of Hazzard Style! Don’t know if those 200 series cruisers are as tough as the General Lee though! 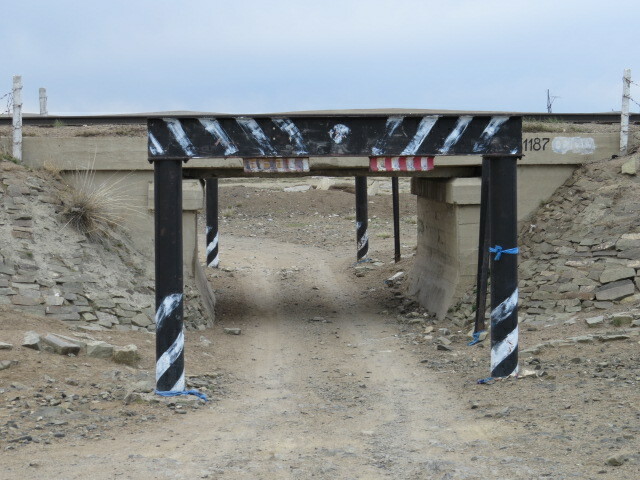 A few hundred kms of corrugated roadwork bypass tracks saw us arrive in Dalanzadgad. 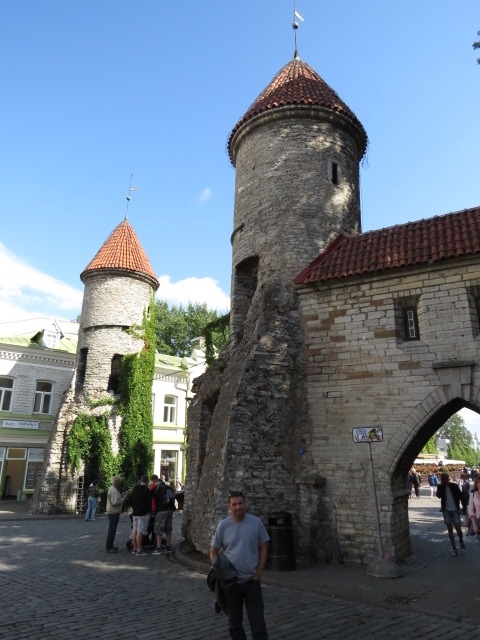 We didn’t have very high expectations of this southern outpost and were quite surprised to find quite a nice town compared to others we’d seen. 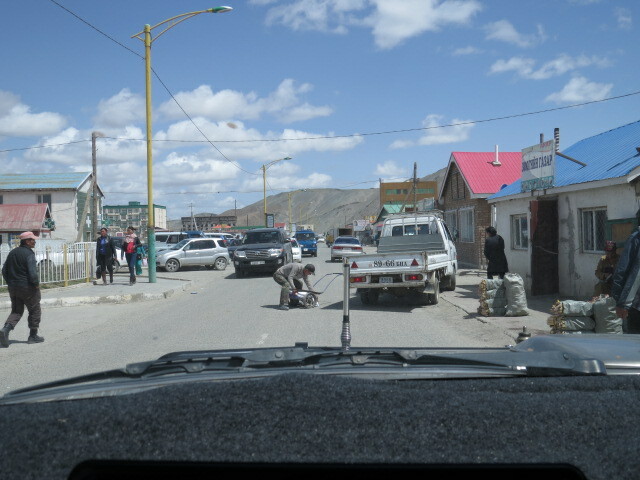 After a walk around we topped up with some groceries and a group of locals approached wanting to look at the vehicle. 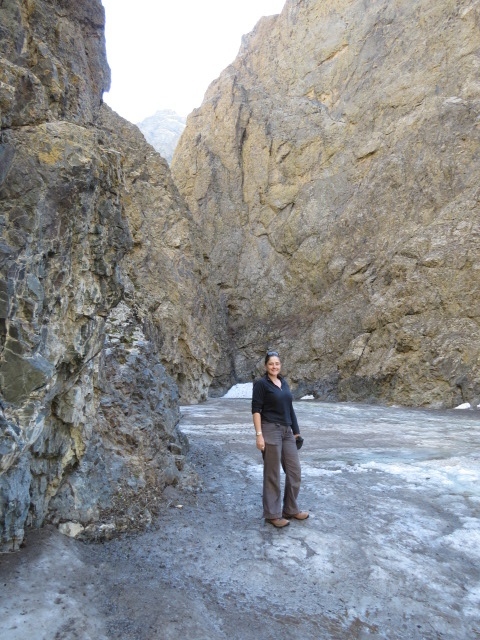 Then we headed to Yolyn Am Ice gorge. Once again the GPS waypoint was loaded and we headed for the National Park entrance. 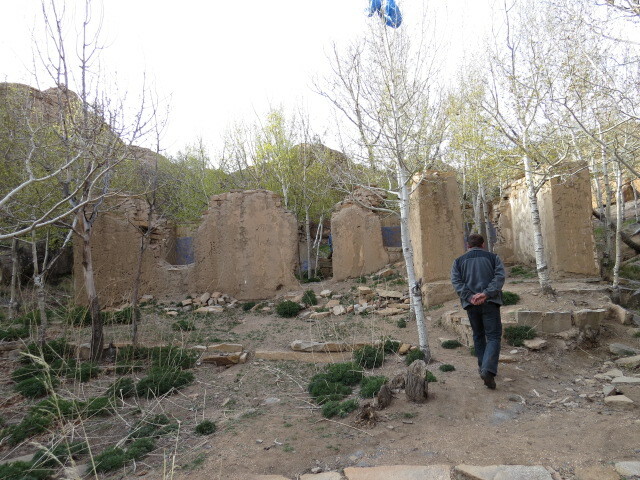 Another 10km saw us wandering down a valley at some 7500ft along ice flows whilst being in the Gobi Desert! There is a section you are able to drive through that I’d seen on YouTube and maybe that was a mistake, as I wasn’t overly taken by this section, however it was nonetheless quite striking. Tonight saw us camped at 7800ft, our highest camp to date. Out of the ranges and west across beautiful arid rolling plains and the town of Dalay was approached. I was keen to buy diesel here as although we had only traversed a couple of hundred km’s I’d been told diesel was difficult to obtain in smaller towns and hence wanted to stay full. 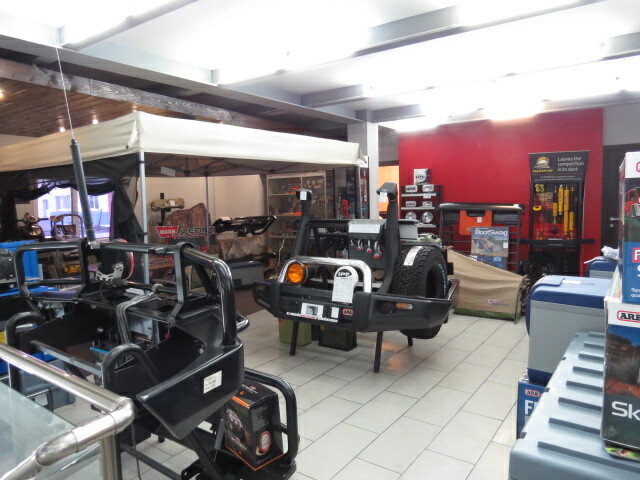 We have 175litres of fuel with a comfortable range, when anticipating sand and hard driving, of 1000kms. Upon arriving in Dalay, we asked some locals if diesel was available? Yes was the answer but we had a little trouble locating the bowser. Quickly the passengers door was opened and Jen pushed up onto the console as a local woman climbed in and gave directions. Sure enough we came to a small fuel station on the edge of the town with diesel. As a point if you drive around the outside of the towns on the open flats you can generally spot the fuel stations. 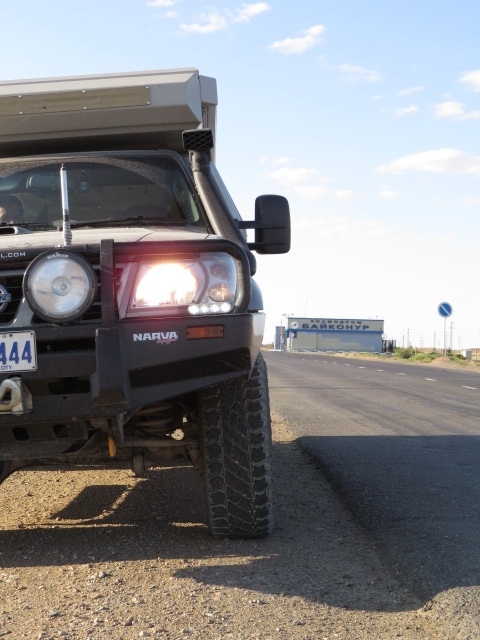 At the time I’m writing this we are well north of the Gobi and at no time have we travelled more than 300kms without obtaining diesel. To be fair though, there is a large number of small diesel trucks and 4×4’s here, so I’d surmise that diesel is becoming more available. We will see what the north of the country is like, hopefully similar. Khongoryn Els sand dunes came into view. The country was really starting to dry out now and was becoming very dusty. A lunch stop and drive up a small valley north of the dunes saw us parked right next to another ice flow within a gorge, I would hazard there are many of these ice flows around the area other than the National Park controlled ones. 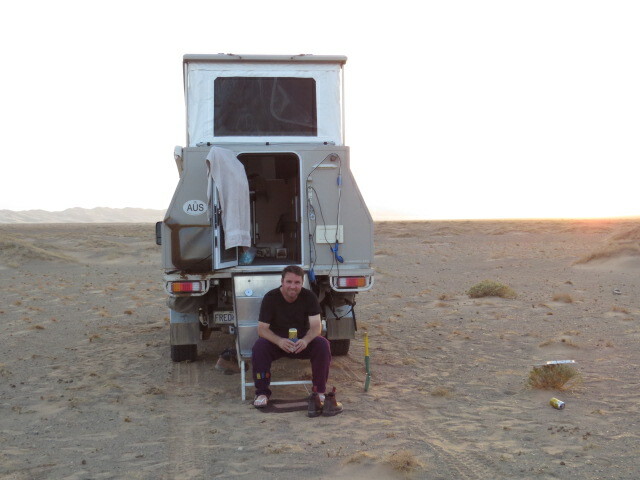 Camp saw us very exposed on a sandy plain alongside the dunes but with a windless evening and beautiful sunset it was a great location. 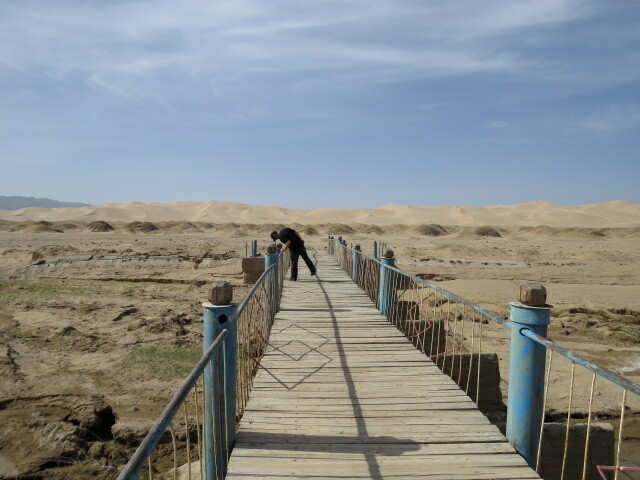 There is a reasonable sized river running abeam the dunes which makes vehicle access quite difficult however the following day we got a little closer and with a little luck found a bridge that I think has been put in by one of the tourist ger camps to provide easy dune access. A 500m walk saw us on the dunes and upon our return to the vehicle you could tell there was a change in the weather afoot. No sooner were we on the track than a sand/dust storm began, reducing visibility at times to no more than a few meters. Whilst it lasted the next couple of days fortunately it wasn’t consistent and we had long periods of great visibility. 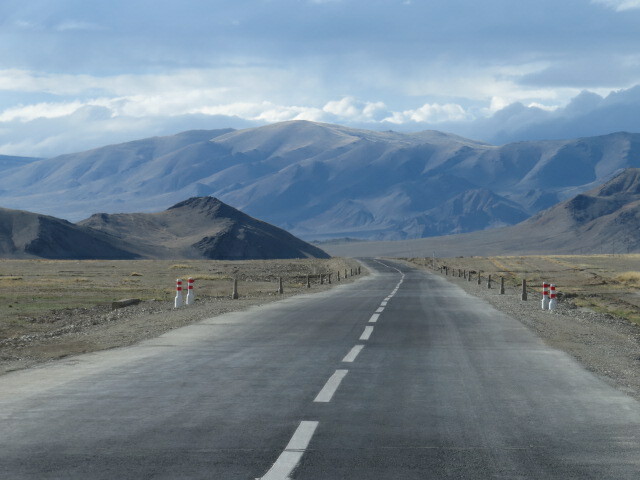 We headed north across the Gobi and some of the best driving so far with tracks winding their way along the tops of the rolling peaks, affording stunning views and opportunities to spy on the lives of the nomads as they go about their business. 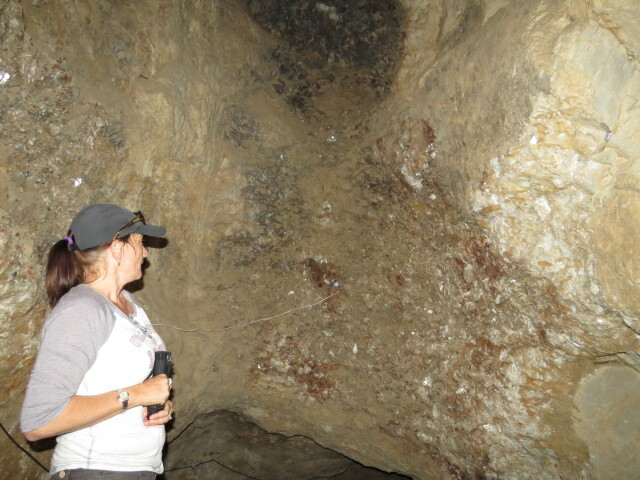 Next destination was Tsaagan Agui or Crystal Cave, a cave in a small valley that has given up stone tools that have been dated back to 30-40000 years ago. It has some crystal formations lining its walls that make it unusual and impressive. GPS loaded and we headed up valleys and through mountain passes sometimes on tracks and lots of the time just heading that way. You drive for great distances in this country with no sign of infrastructure whilst stopping and camping anywhere you like and yet when you arrive at a well known site you find a gazebo and a segregated parking area – what the?? As we drove to the beginning of the gorge we were suddenly met by a group of teenage boys with very sticky fingers, opening the Patrol’s door and suggesting that they show us the cave. It was quite uncomfortable and there is, of course, no one else anywhere! 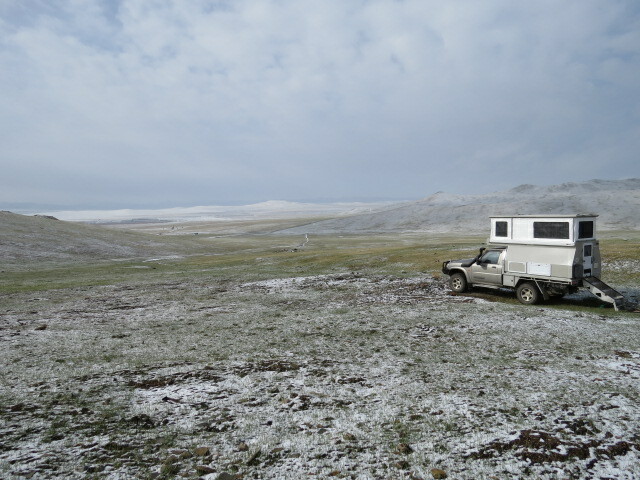 So we explained that as it was late afternoon and we would find a camp and come back tomorrow. We idled away until out of sight and considered our options. There was no way that we could leave the vehicle unattended! Shortly 3 motorbikes with all 9 lads aboard arrived and via hand signals suggested they would like Jen’s hat and some vodka and food along with some other signals I’ll leave out. We fired up the Patrol and headed off, what followed was a silly game of chase the tourist! I have well over 1000km range so wasn’t overly bothered about making it clear of these idiots. Anyway eventually they figured out we weren’t going to stop and decided that if they stopped their bikes across the track in front of us, that would work. As there wasn’t anyone around I was tempted to just run over them, a point they seemed to work out as we didn’t react or slow down. I guess having tyre tread across their forehead didn’t appeal to them! After some 30 minutes they reluctantly retreated and headed back toward the cave. Now we were really annoyed, we’d come a long way to see this cave and missing out because of some testosterone filled clowns didn’t impress. I don’t really think we were at any real risk as they were just mates egging each other on but you don’t really know. 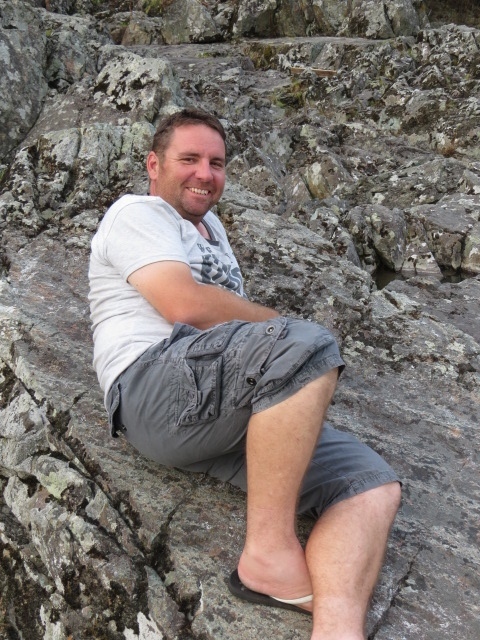 We looked at our options and the map – “hang on – that little gorge goes north to the other side of the range – hmmm”. So after negotiating some steep hills and winding around some creek lines and other small challenges we managed to park the Patrol within 500m of the cave on the other side of the gorge. Torches in hand we headed down the gorge on a stealth mission and entered the cave that we had come to see! It all made for a late camp as upon our departure the wind came up and it was quite a few km’s before we managed to find a nice protected site in a gorge. The next section north toward Bayankhongor would be one that required a lot of luck if rain was about. 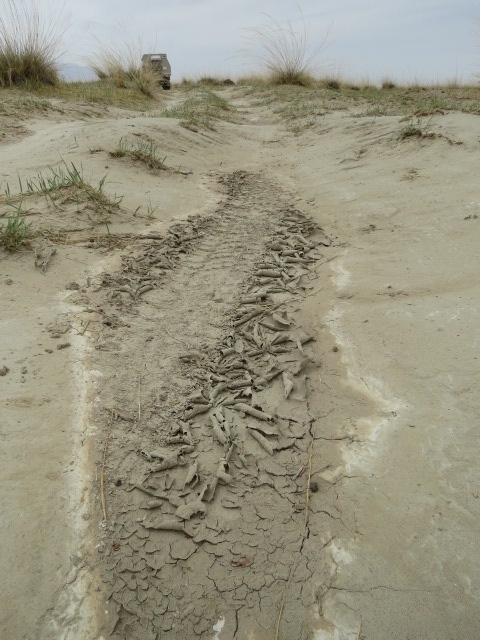 Very low lying terrain with lakes and marshy areas and no recent tyre tracks ahead made for a very careful approach. The terrain was firm enough with only the odd section requiring 4WD but I do think we were quite lucky as being early in the season it could have easily required a long detour. 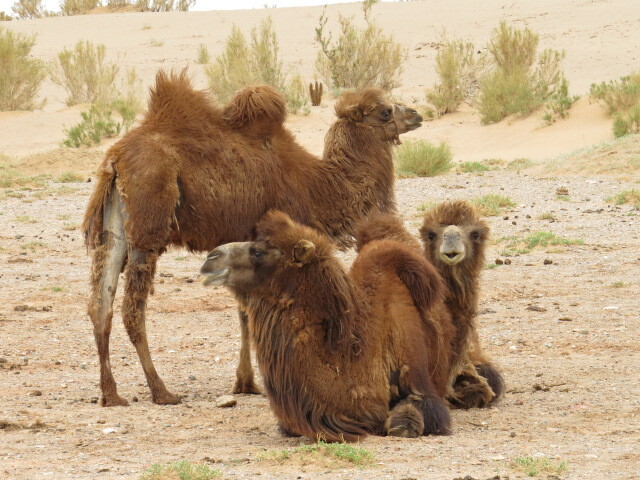 A family of camel herders came into view and we managed to pick our way through the scrub around their herd of camels that were all over the track. From their smiles and waves we thought they had appreciated our efforts so we stopped for a chat. With hand gestures and maps they cottoned on to what we were up to. The now mandatory look in the vehicle and we were on our way. They seemed to being doing it pretty tough and yet give off the aura of happiness and want for nothing. Late afternoon saw us back on lovely grassy rolling hills and looking for a campsite. 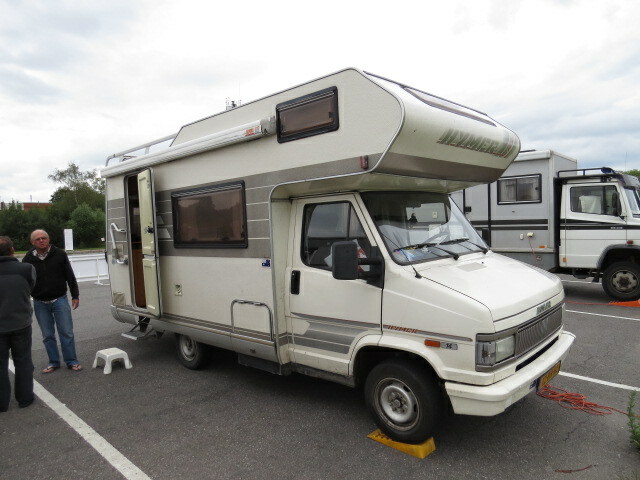 Lovely grassy rolling hills are great but don’t really provide the protection from prying eyes or the elements that one desires so it can be a challenge to find a suitable campsite that isn’t already occupied by a ger! We found a nice little rocky hill and nuzzled up alongside for some protection. Beverages prepared we wandered up the rocky outcrop and relaxed atop whilst viewing our surrounds. 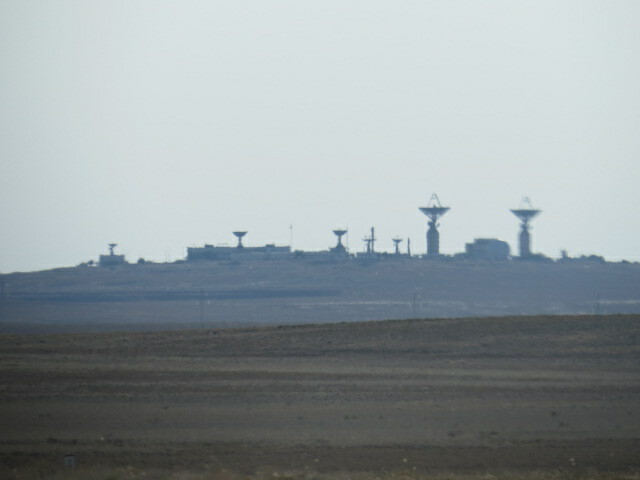 We could see about 4 ger camps but they were quite distant! If you can see them then they can see you…. 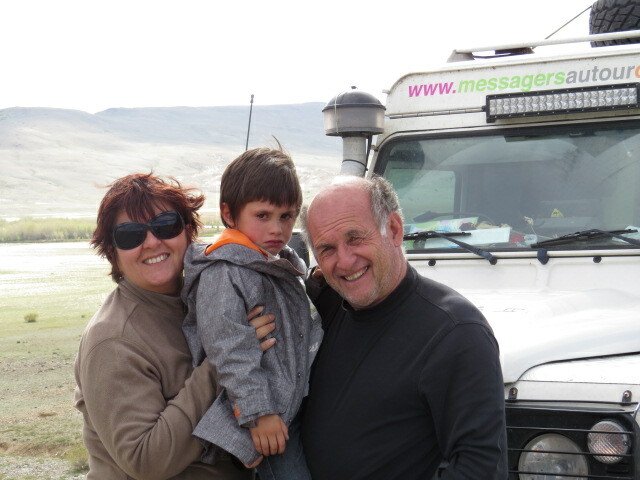 Just as we returned to our campsite came the unmistakable noise of a motorbike and over the hill came a family of three. Yep we ‘d been spotted all right and curiosity had definitely gotten the better of them! 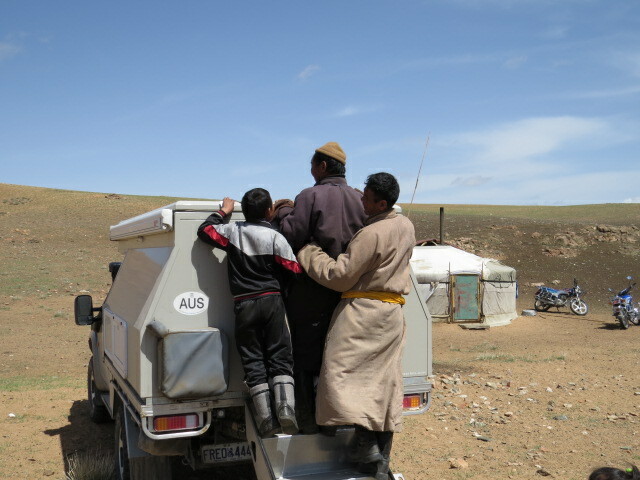 A couple of hours later and after numerous discussions and reference’s to our phrase book and the mandatory few arkhi’s (vodka’s) we were invited to join them the following morning for milk tea in their ger! We were quite excited by this prospect as interacting with locals that approach you in the backcountry is the type of experience we are always looking for. It’s so far in front of the organized ger visit. 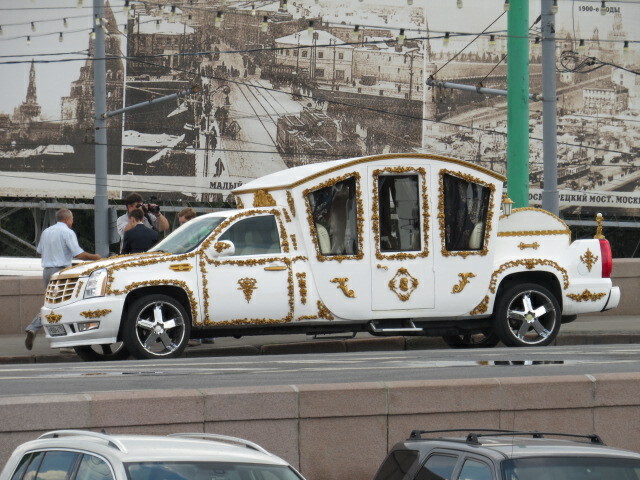 We arrived to smiles and waves and the lady of the ger ushered us inside. I must apologise at this point, the chances of me converting their names into the King’s English is pretty well zero and the fact that I can’t pronounce them doesn’t help! Rice with mutton was served and went down a treat, followed by bowls of milk tea to which we also did justice! A friend of the family promptly arrived and with the family’s son whom we hadn’t met the day before we now had a cosy group of 6. 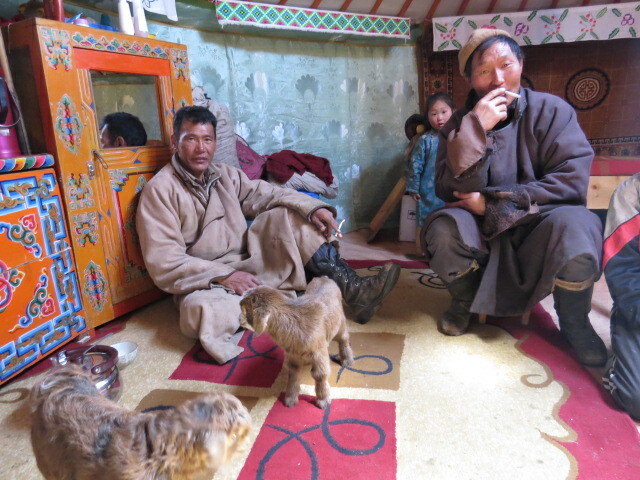 Maps and discussions around goat herding ensued and we marveled at the warmth and strength of the ger, it was seriously windy! 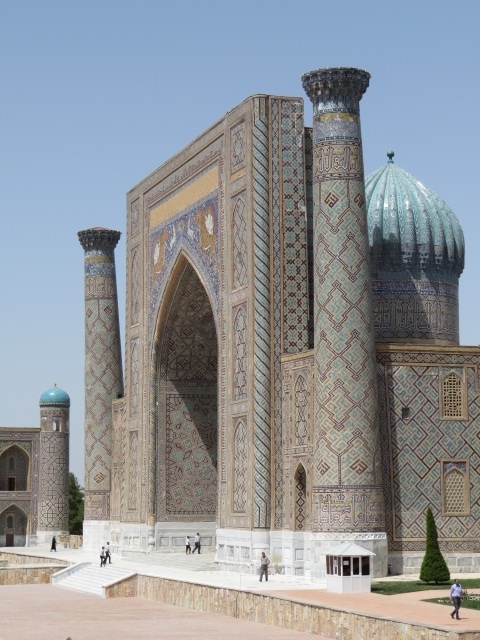 The 12volt TV standing there along with a pot belly of design from the day’s of Chinggis Khan all seemed like a contradiction and yet so practical. 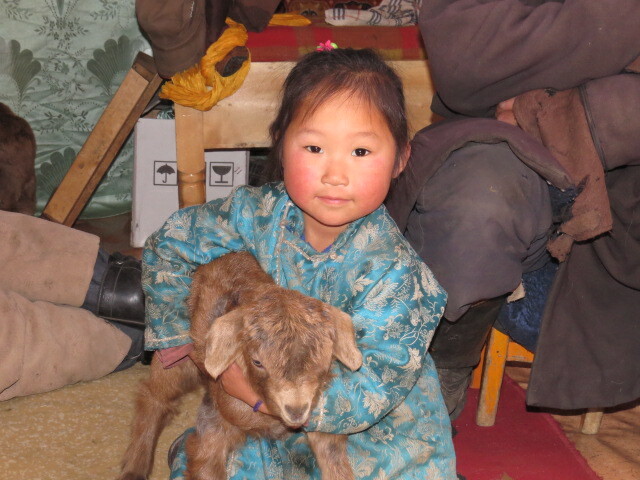 Baby Goats were quickly retrieved from outside and just added to the experience as they nervously wandered around the circular ger! After a couple of hours we headed outside and the Patrol became the focus. 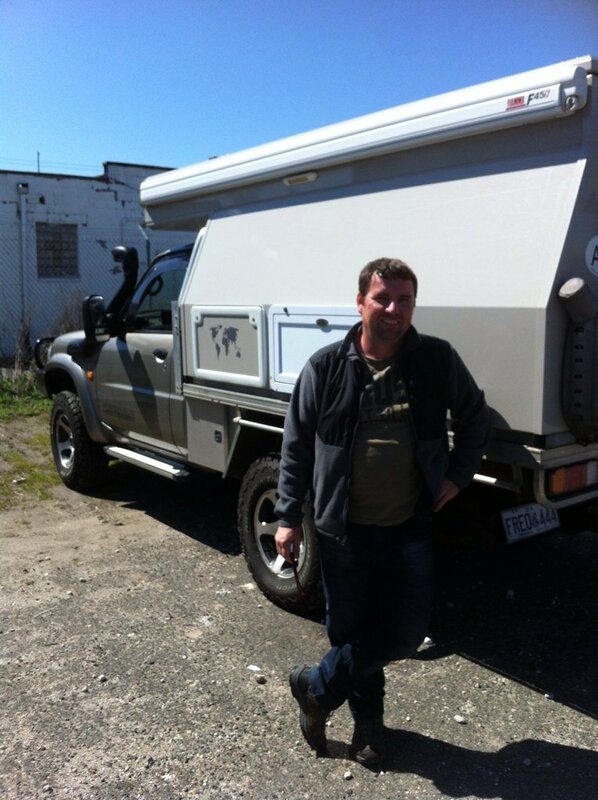 Bonnet up and camper roof extended there wasn’t a millimetre that didn’t receive a thorough going over… Goodbyes and handshakes and we were once more on our way. 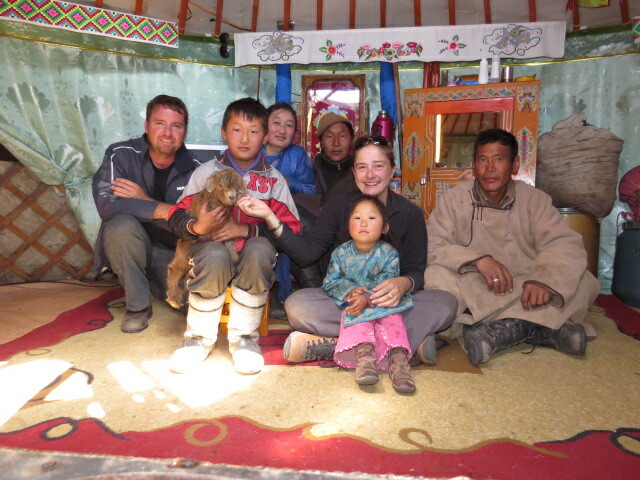 This family had been so friendly and welcoming that it was actually quite difficult to move on, I hope others are fortunate enough to experience similar. 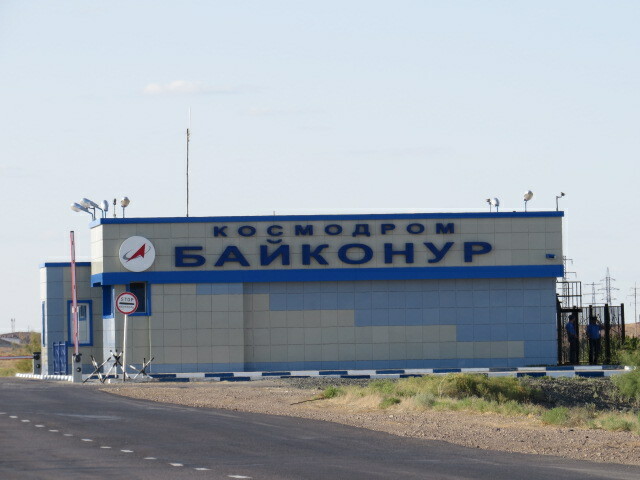 To Bayankhongor. It’s hard to explain but you drive along tracks with random gers and free roaming stock and then you come to a town that consists of timber fences enclosing gers, some government buildings and a fuel depot of some sort. The really weird part is that many of them have these “theme” parks, which, sometimes, consist of reconstructed dinosaurs, and the like but seem to have been abandoned part way through construction and now just sit derelict! Maybe some road repair before the theme park development – just a thought. We were heading for some hot springs, touted as the highlight of the region, and then onto the town of Uyanga. We left the main road once again and wandered along the myriad of tracks in the general direction of the springs. 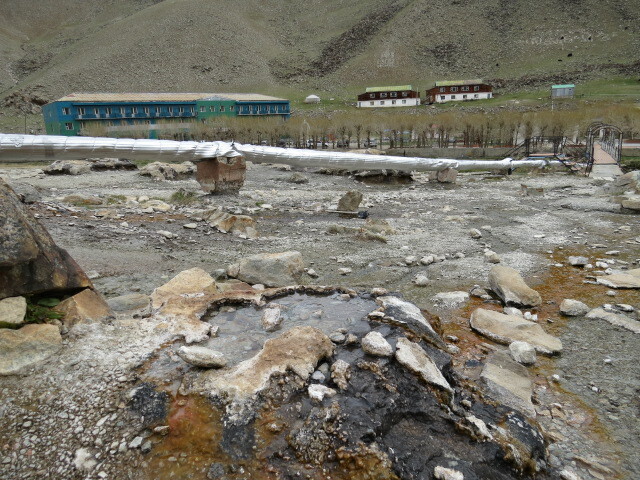 We arrived at the springs but weren’t really able to access them easily as there was a ger retreat located next to any available point of hot water. Most of them seemed in total disrepair and the whole area wasn’t overly inviting. The track deteriorated rapidly but was still showing signs of frequent use so we pushed onward and upward in altitude and past ger after ger! The quantity of traffic using the track was obviously reducing the further we drove and I should have seen the signs earlier! Encouraged by the fact that it was shown on two of our maps we ploughed on. Eventually it was very muddy and rough with tricky sections requiring some low range and definitely choosing the right line but we were still hopeful of making it over the high pass at the end of the valley. Eventually we passed the last ger and the tracks ended abruptly but we continued. Maybe after that next crest there will be another track! Well that never happened and we went well beyond where we should have. I really don’t like off camber hill climbs in snow with one vehicle and no tracks whilst half way around the world! Being early in the season was definitely a factor – I think another month and you could head over these passes’ quite easily. There is a lot of snowmelt in the valleys and particular caution must be used in these areas. Numerous times we sank through the grassy crust but fortunately never stuck! We retreated and headed north up another valley toward Tsetserleg but once again we were really taking a risk, it was obvious that the locals were not yet using these passes and so a U-turn was performed. We camped part way back down the valley, as we were some 60km from our start and now exit point. A cold night followed and we woke to a snow covered freezing Patrol in the morning. 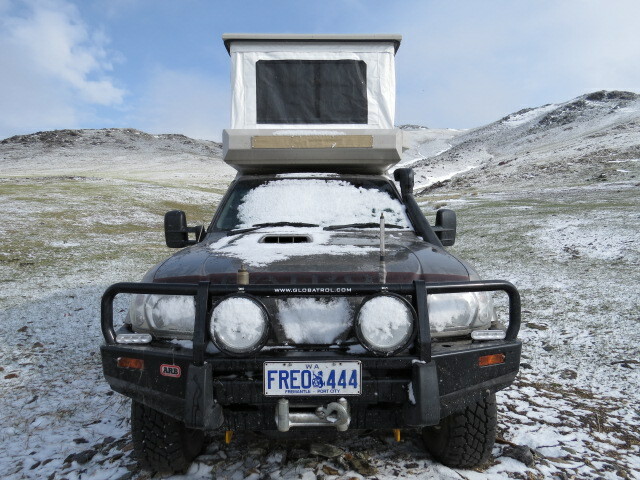 I really don’t like starting the vehicle in these conditions after a freezing night at altitude. Until you get some heat into the engine there really are some undesirable noises. I try and keep the freezing wind out of the engine bay overnight and hope for some sun in the mornings to take the edge off, but it’s not always possible. The next day we exited the valley and headed a little further east and up another valley that was encompassed by lower mountains and seemed to contain more open contours. 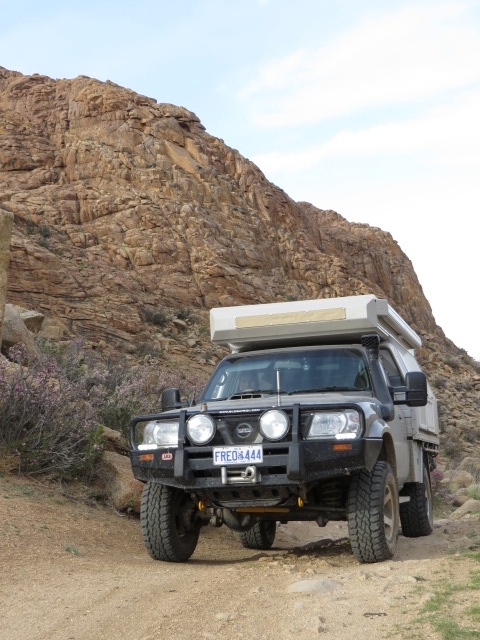 It was the complete opposite of the previous valley – fairly dry and hardly the need for 4WD at all. In fact you didn’t need to bother other than the fact some of the tracks were quite steep so why wouldn’t you engage it. 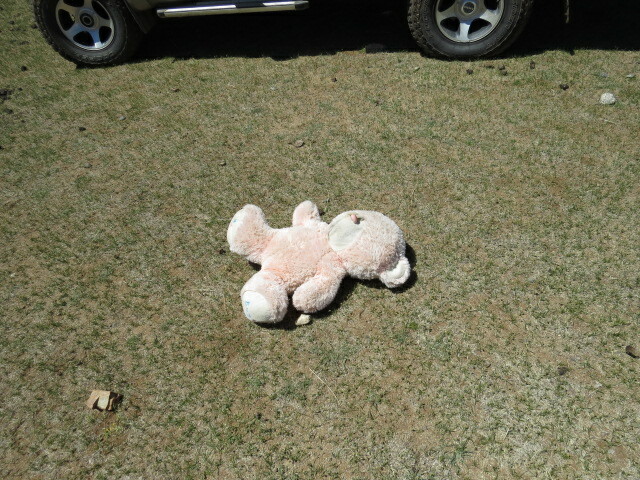 We also spotted the extremely rare Gobi Bear! Haha We had a great camp with lovely vistas along the valley. Another very windy morning and after a brisk walk we continued. 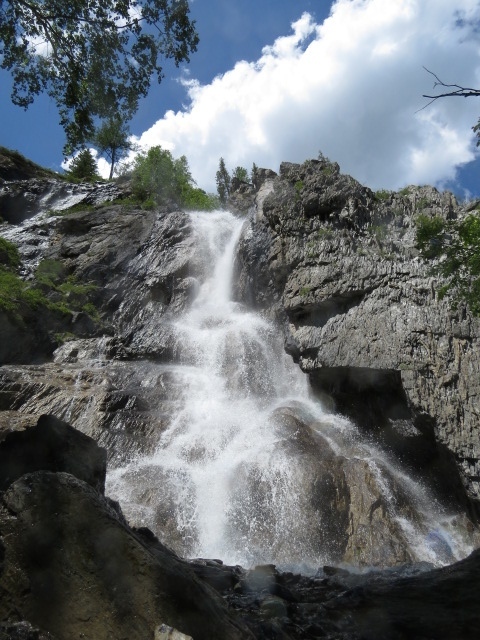 We arrived at Uyanga via this alternate route and had intended to continue onto the 8 Lakes and Orkhon waterfall, which are supposed to be quite impressive. 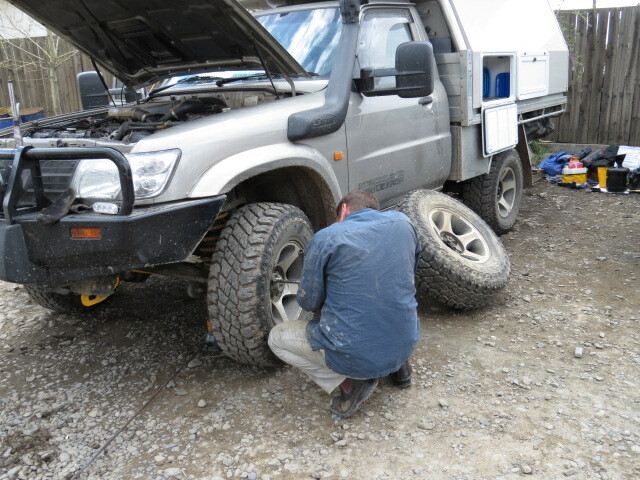 After a couple of hours hunting for a way of getting further toward our goal without including a stage of the warn winch challenge we realized that we would have to find an alternate approach. The tracks are sodden and devoid of any local traffic at all. I thought it possible at this point that if we had a second vehicle we could have persisted but as we were solo the answer was obvious. We headed southeast toward Arvayheer and a stint on the black top, we would have one more go at heading into the area of the waterfall – not so much for the waterfall but the fact I didn’t really fancy the 150km blacktop run as opposed to the 50km of tracks that would see us at the same location. 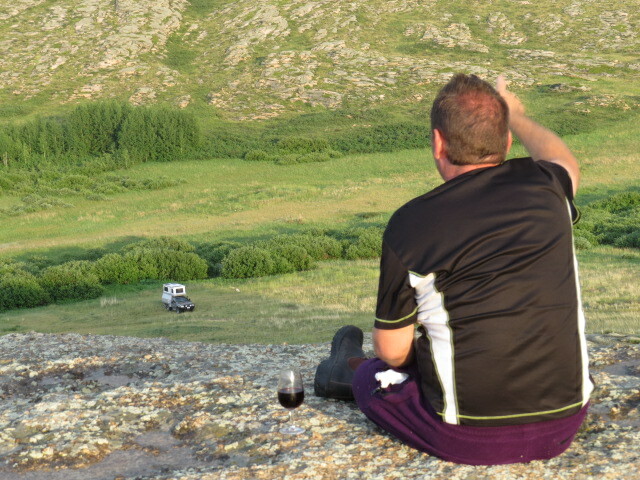 We found a camp at sunset and settled in to cook a bolognaise that definitely hit the spot. 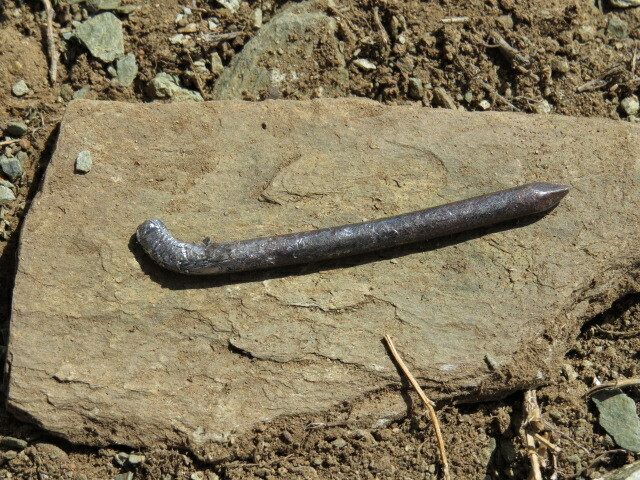 The morning saw me plugging a rear tyre after removing a 2.5-inch roofing nail (don’t ya hate that). It’s either tech screws or nails! Some things don’t change the world over!! So we picked a valley and followed some tracks toward the town of Khurjit! Now this town is north of us but also has a main road running north from it, hence I didn’t think it would receive as much traffic as the other pass’s we’d attempted and hence was less concerned about fewer tyre imprints. 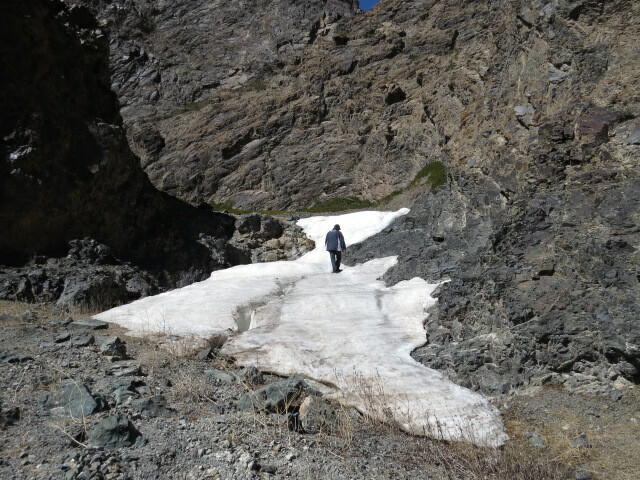 About 15 kms up the track we once again encountered some heavy snowmelt and sloppy but reasonably firm terrain so we pushed on. Shortly after, we crested a high point on our map and were feeling a little more confident of back-dooring our way north. We began the decent over almost dusty tracks and then were suddenly greeted with a view of the track and valleys ahead. I could see lots of water and heavy ruts along with a couple of UAZ vans so out with the binoculars for a quick scan. 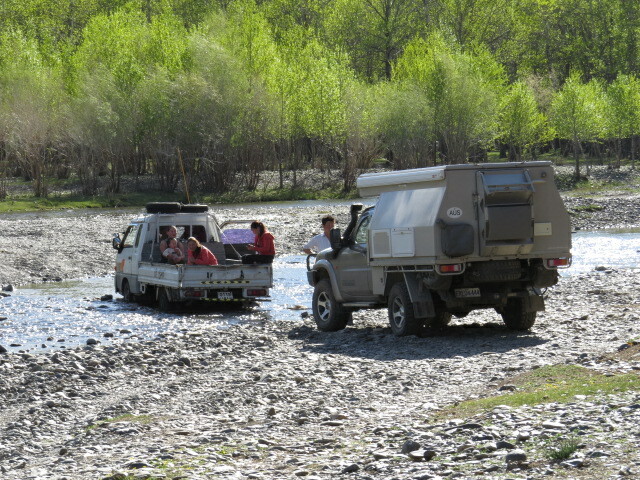 Those UAZ vans might as well be gers, as they weren’t moving anywhere, bogged in the middle of the sloppy valley with Mongolians like ants around them trying to extract them. Any movement in that direction also meant joining the recovery team, an idea I wasn’t totally sold on so yep – U turn. 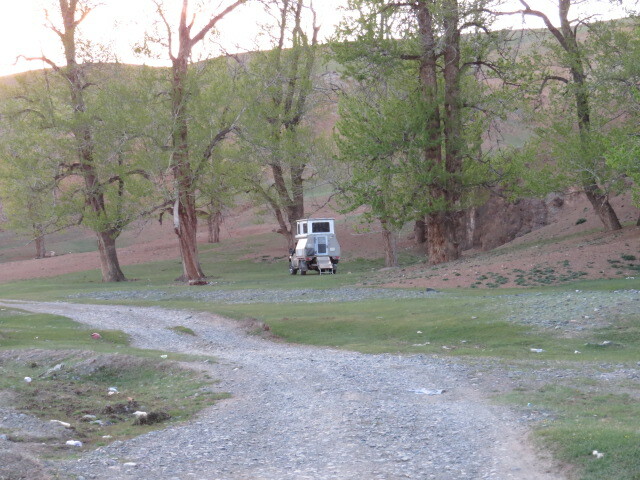 We did have a go at another valley but we were losing interest by now and decided to hit the blacktop – well drive over rough tracks alongside it as it’s usually smoother. 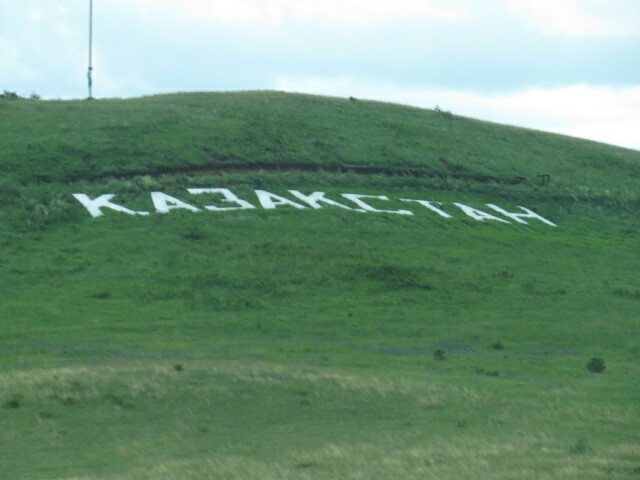 So on to Kharkhorin and the centre of Buddhism in Mongolia. 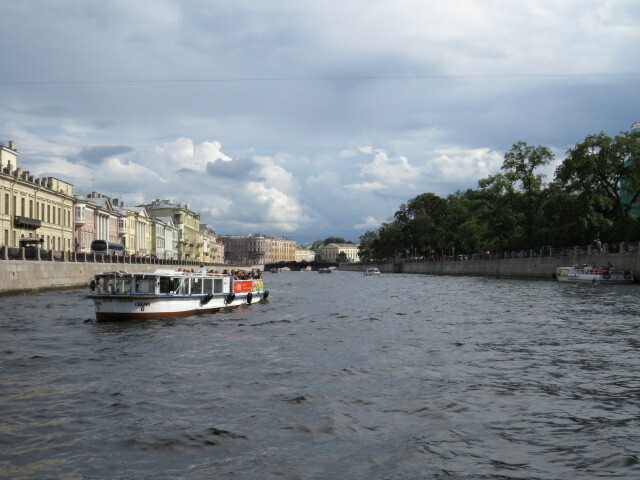 Lot’s of western tourists, which was a little weird having not seen anyone for so long! 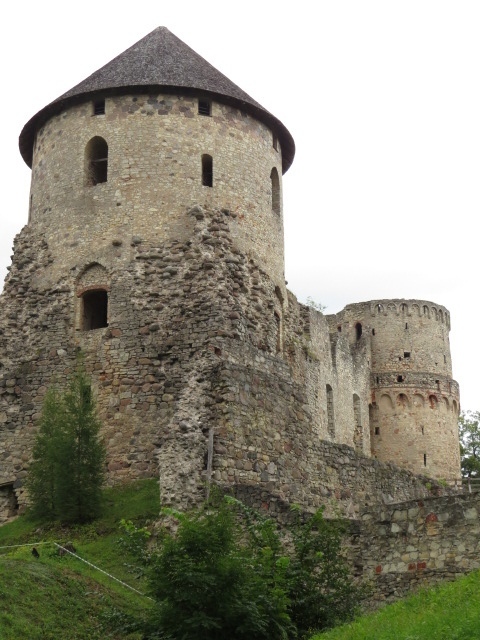 We continued north toward Tsetserleg and found a spot for lunch. 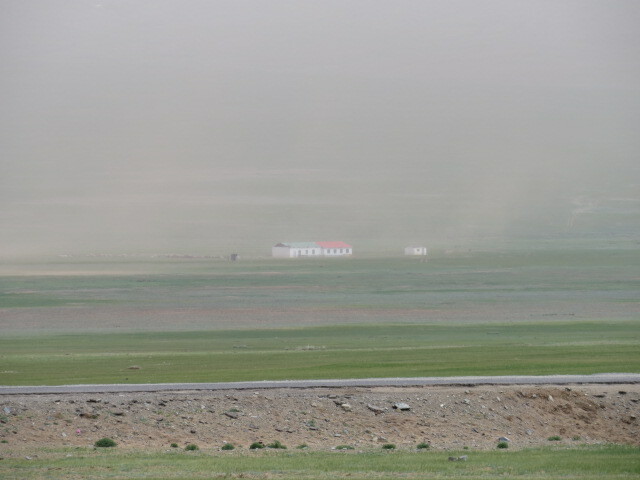 The sky looked a little weird and yellowish, half way through our lunch we realised it was a dust storm and within 5 minutes we were in the cab being buffeted by massive winds and subsequent pouring rain. I was really thankful not to have been the recipient of hail as the sky began to take on that ominous deep grey. Anyway the car got a wash, which was nice! 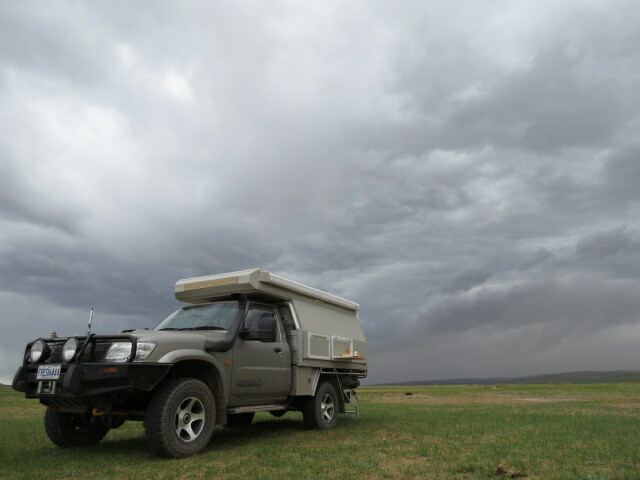 The gale force winds continued and we were a little worried about finding a camp that would provide protection, so we drove further than anticipated and found ourselves on the outskirts of Tsetserleg. Saved by the bell however we noticed some gorges to the south of the town and after negotiating the bumper cars we found our way 5km south and are camped on a lovely little stream with a small gorge for protection, which we really need as the wind is howling! Now I’m going to have a beer as this is the second time I’ve written this complete post after the Muppet I’m travelling with irrevocably deleted it earlier today!! 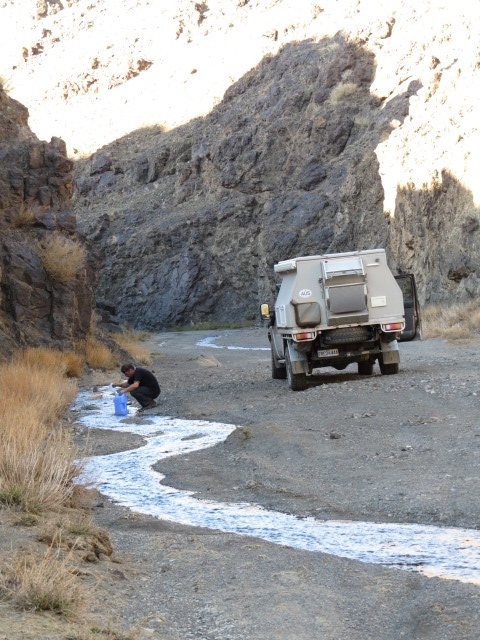 PS: At the point I was halfway through my quite relaxing beer when a small truck drove past our camp and proceeded to get stuck in the little river that is flowing by! So next thing there is young local guy requesting our assistance, I couldn’t tell him what I was really thinking so proceeded to pack up the camper and retrieve his little truck from the creek! Peaceful now – I think! 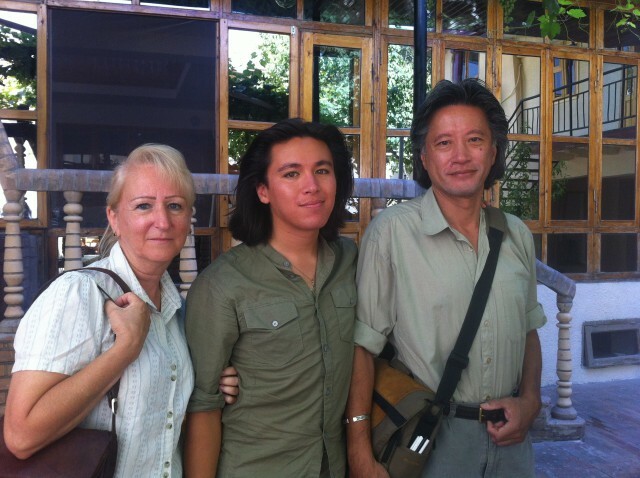 This entry was posted in general, Mongolia, Russia, Vehicle, Visas on May 28, 2014 by Jen. And we did. 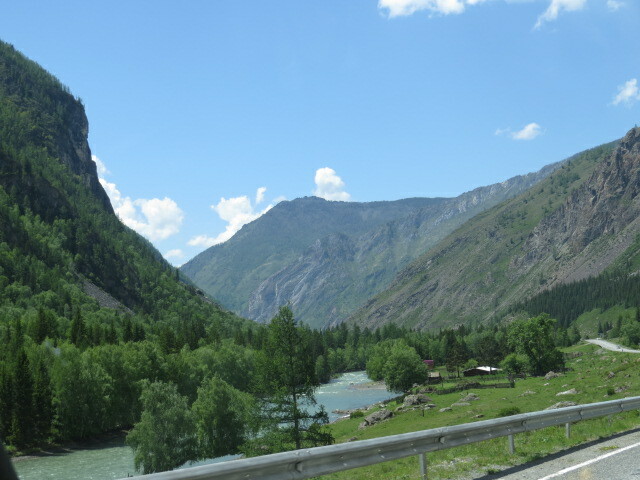 The drive west from Chita proved to be quite picturesque. Glimpses of snow capped peaks with icy streams and road elevations touching 3600ft. The highway however was in a bad state of disrepair. Now I love driving on rough roads and tracks, beaches or just about anywhere off the blacktop. But I detest bitumen roads that haven’t been maintained. 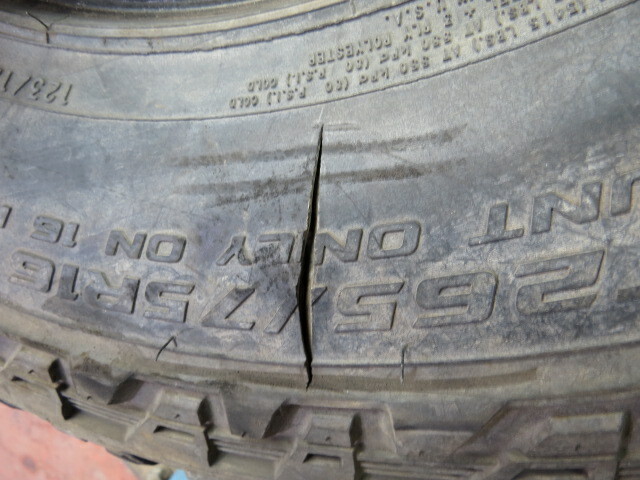 The roads here have been long stretches of undulating and often broken seal with BIG potholes. Just as you get a nice smooth stretch and take your eyes off the road and allow the accelerator to descend a little closer to the floor you are met with the sight of the tacho increasing in revs at the same speed the cosmonauts head into space as you also leave the ground and become weightless! Landing is always rough but the locals consistently power past in their Corolla’s with exhaust systems leaving nice little grooves in the humps of bitumen and it’s hilarious to see them bouncing around in their cars reminiscent of being in a pinball machine. 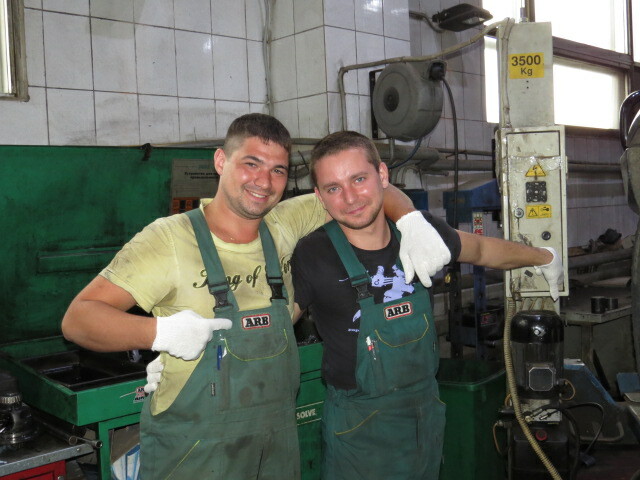 If you want to go into business here, then start a suspension repair shop you will never struggle for work! 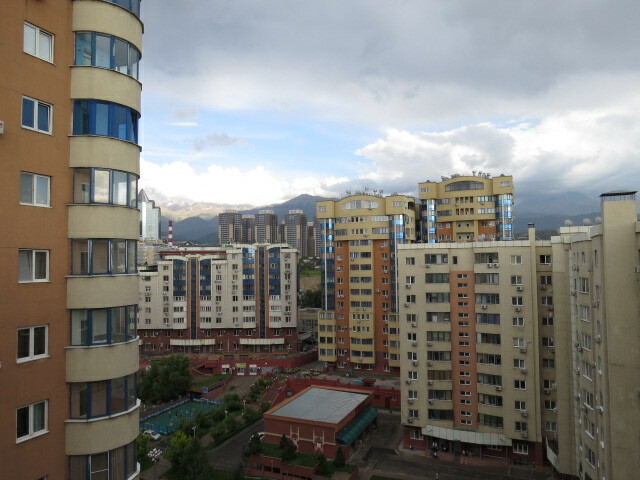 After more than 4000km Ulan Ude finally came into view. 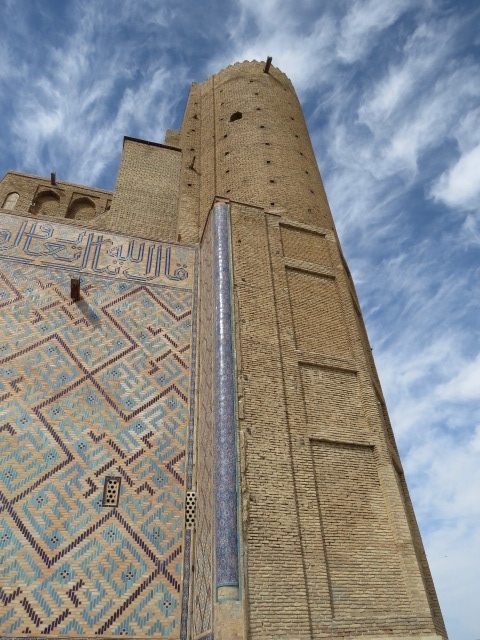 Here we would apply for our Mongolian visa’s but unfortunately for us you can only drop off your passports Monday, Wednesday or Friday mornings. As we had arrived Monday afternoon, we had missed the opportunity. 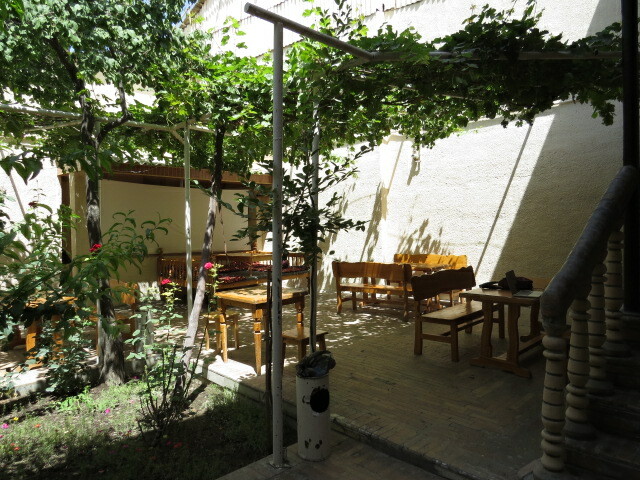 Tourist Information Centres are virtually non existent so we opted to visit a local hostel with great reviews on Trip Advisor and a host who spoke good English to seek information. 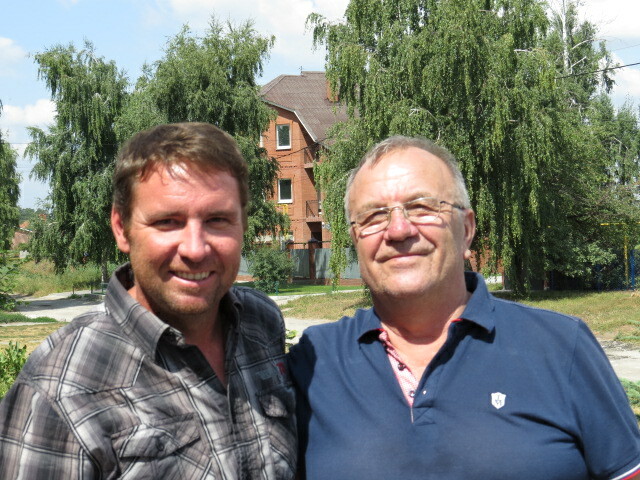 Denis was fantastic and was a wealth of information about Lake Baikal and general tourist information. His business is Ulan Ude Travelers House and his website is http://uuhostel.com After our brief visit with Denis and obligatory cup of tea, we decided to have a quick look around the city before stocking up with supplies and heading north to Lake Baikal for a few days! Sorting out our visa’s would wait until our return. I intended to camp en-route before arriving at Lake Baikal but the highway proved to be in excellent condition and we were really excited at the prospect of making it to the lake. 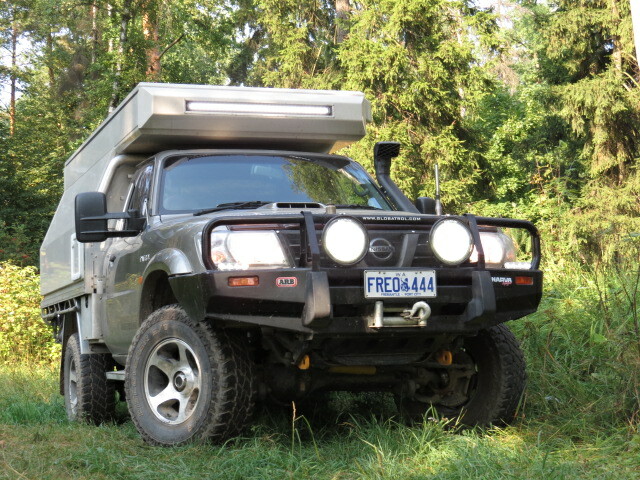 Fortunately we had previously loaded a campsite waypoint into the computer that Ron Moon of 4×4 Australia fame had used during his sojourn across Russia and hence I wasn’t overly concerned about chasing down a camp in the dark! I was more than thankful however for the HID driving lights and 40inch light bar, I don’t intend driving at night often but when you do and it’s misty, really cold and your not sure what’s ahead then being able to light up the foreground is more than a bonus! Thanks Narva!!!! We arrived in almost darkness and the lights lit up the icy crust of the lake as we descended to near the shore-line. 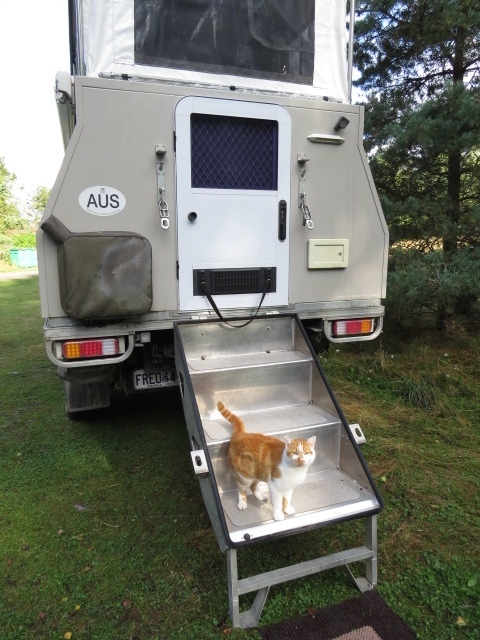 When we exited the Patrol we quickly realised that the heater had been working fantastically well and scrambled for jackets beanies and anything within easy reach. Next morning we were rewarded with our first vista of this truly amazing lake. An icy shoreline and just visible in the distance was Olkhon Island apparently sporting some of the best scenery on Lake Baikal but not on our itinerary this time! We headed north along the lake at a lazy pace observing the now familiar village lifestyle of ramshackle timber houses, cows and vegie patches with of course the ever-popular UAZ Bongo vans. 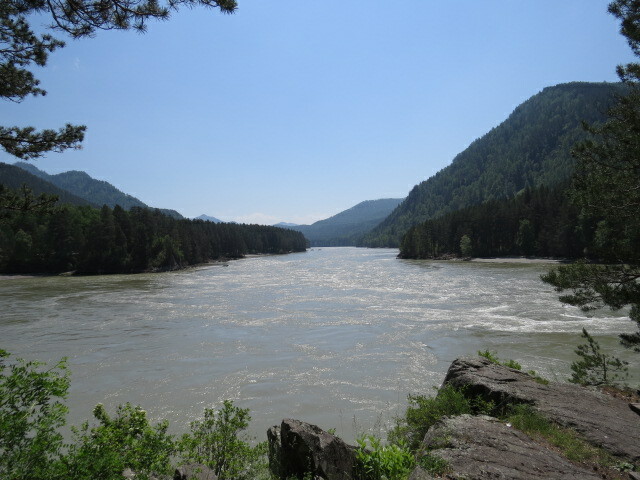 A lazy couple of hours later and we were at the entrance to the “Holy Nose” Baikal National Park. Some hand signals and grrrhh noises from the park attendants informed us of the possibility, however slight, of bears! Adds a whole new level of intensity to your hearing when you exit your camper in the middle of the night for a pit stop. Maybe lay off the beer and not find myself reported on in some travel advisory website as an Australian idiot abroad – taken by a bear due to his inability to leave his drinking habits at the gate! Beautiful scenery awaited us and we only headed on a few km’s and with the sun out, that was it! 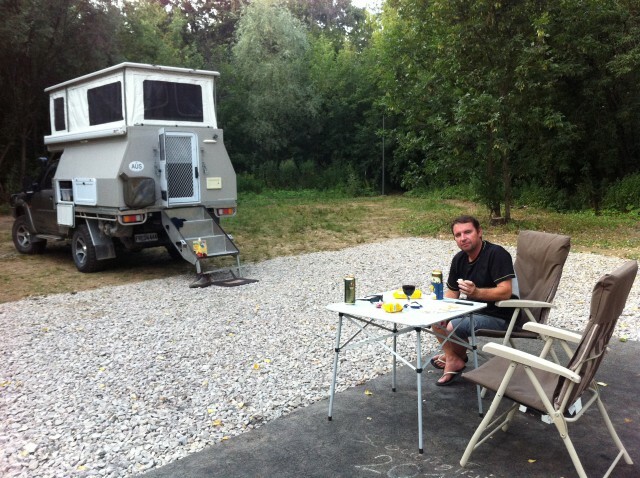 We parked up for a couple of nights and got in some serious relaxation after the previous days of long driving! Pure water with ice bobbing around and no one anywhere just the way we like it! The next day however proved windy and quite cold but nonetheless spectacular. A further exploration to the furthermost village on the peninsular was enjoyable with lots of steep tracks and mud holes to break up the drive. Upon arriving at the village there was little to indicate human habitation. Some curtains rustled in a window as we passed by and some fisherman, with the usual stone face frozen in place, wandered around disinterested! 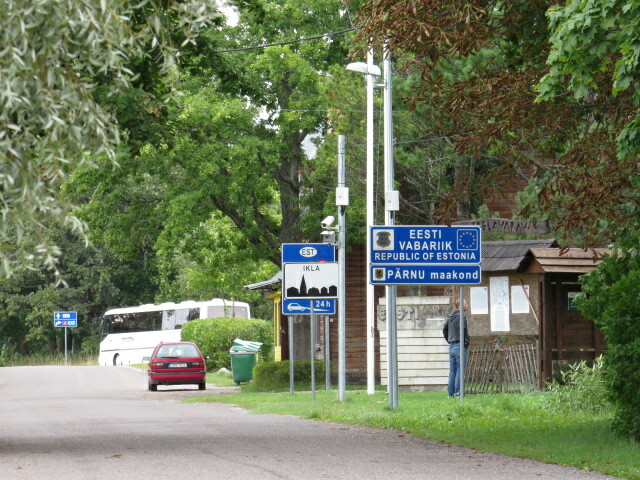 The following day saw us back at the park entrance and after many confused looks and hand gestures we were met with a large Russian smile and were on our way. I’m sure we were supposed to have paid extra for each nights stay but it was all just to hard for the Russian Ranger! We found a cosy little spot on the Lake once more and after a few drinks heard the rumbling noise of an approaching vehicle – Strastvootjya and we were to be friends. Sergey turned out to be a wealth of knowledge and with no English to match our grasp on Russian we had many convoluted conversations about the lake, fishing, the weather and Russian life. 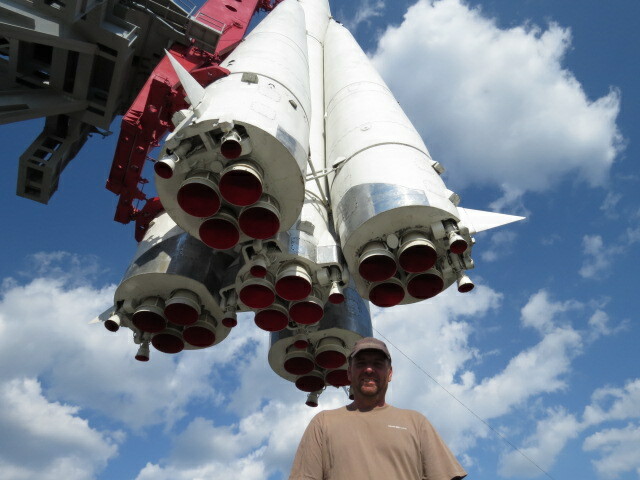 The following morning Sergey returned and suggested we tag along with him for some more Russian hospitality. 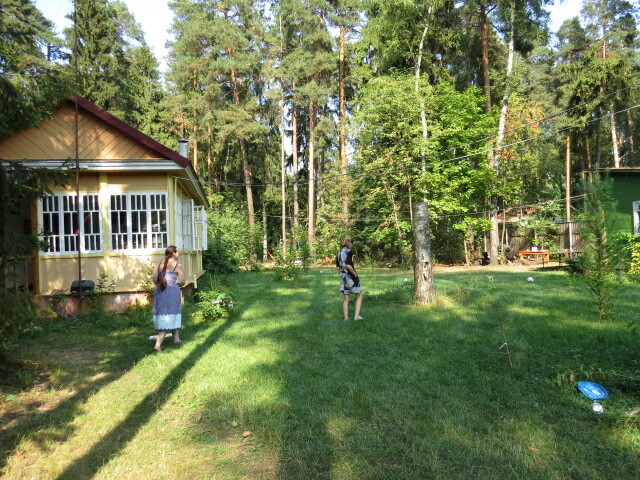 First we harvested some Birch tree water and then headed to the town of Maksimikha to his house! Birch tree water is a popular health tonic in Russia and is harvested by tapping into a mature Birch tree and placing a wick into the trunk and dangling it into a large plastic bottle. Amazingly, the tree can produce about 5 litres of water in 24 hours. We have tried this several times now and find it like mildly flavoured water with a slight sugary taste which has varied in flavor from region to region but always enjoyable. 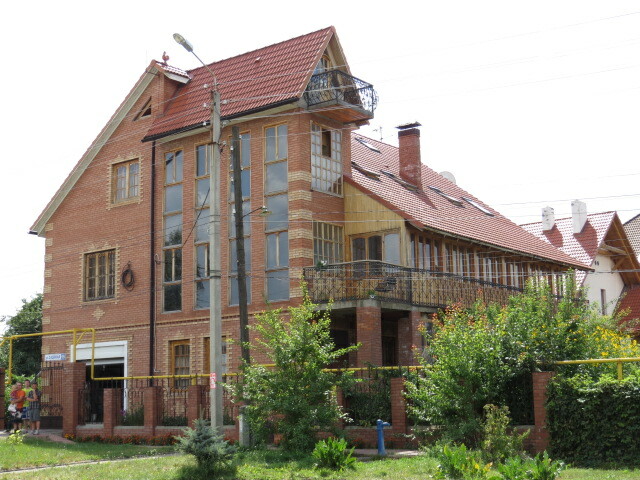 An interesting 3-storey timber building built by hand by Sergey provided great views of the lake. I did spend a lot of time avoiding power-lines just above my head (and I’m short!) 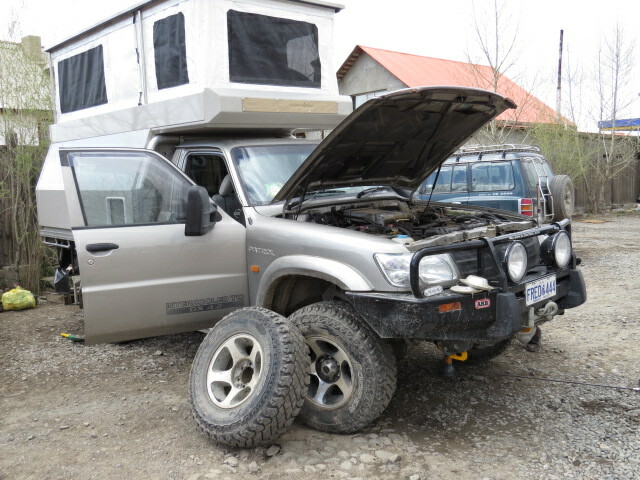 and trying not to be dependent on our Nomad Travel Insurance for a return journey home. 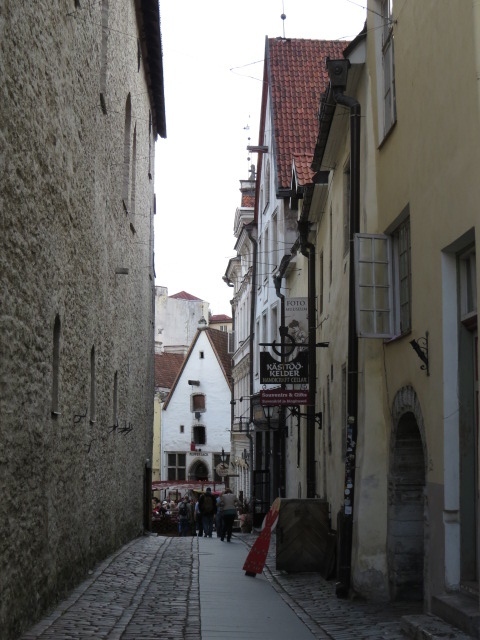 Building standards are a little – well non-existent! 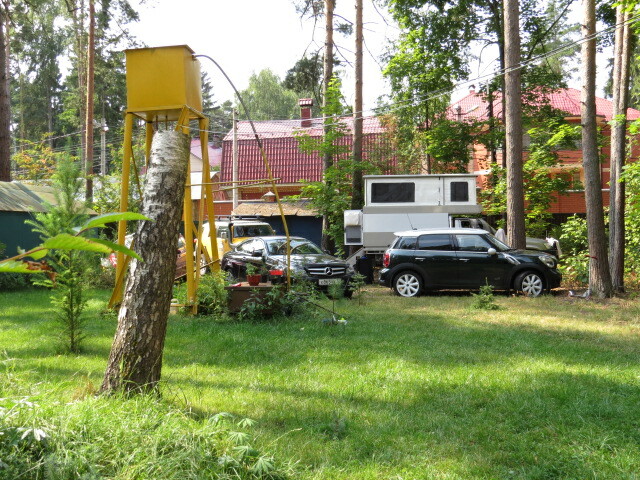 Back to ground level and into a small one-room building where Sergey spends his time – the larger building he rents during the busy season for a little extra income. I had been asking about the Omul fish of the lake as we are early in the season and it doesn’t yet seem to be for sale along the roadsides! I’m glad I asked in hindsight however the following meal just about ended my generally adventurous pallet! Around the back of the hut and in a bucket under some rocks were some Haragos! A fish of around 30cm that is generally easy to catch at this time of year as opposed to the Omul which are usually caught in deeper water. Maybe I shouldn’t have shown so much interest as shortly I’d be eating one of these slimy raw suckers! I quite like raw fish, particularly in the more Japanese style. But a slimy fish from a bucket of interesting water under a rock with blood, gills and lot’s of other remnants of organs required for life still attached was a little out there! Out came salad, bread, caviar, solid uncooked lumps of bacon fat, chilli relish and of course alcohol but this time Russian Whisky! Well, as ever, what doesn’t kill you makes you stronger! I hooked into my first piece of salted fish. It was much better than I had feared but I was struggling with the entrails and blood, so after my second helping, which I am embarrassed to say I couldn’t finish, I’d had enough! 3 shots of whiskey and I can honestly say I’d had one of the best experiences I’m likely to have! 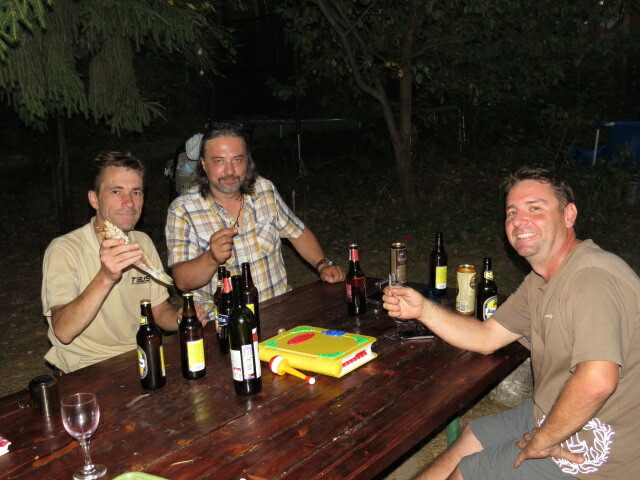 I did have one surprise up my sleeve however and thought it only fair that Sergey try our little Aussie gem, Vegemite. Jar removed from the larder, a thick dollop served and Sergey had an almost identical reaction to me! Jen attempted the bacon fat but found that a thinly sliced cooked version served with eggs is more to her taste! Not Overly Excited by Vegemite! 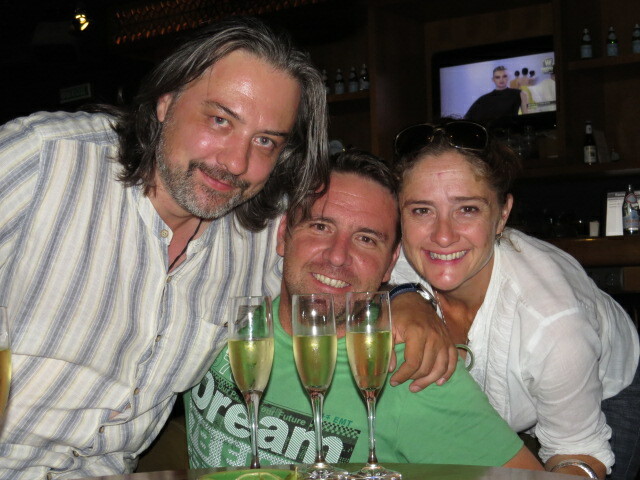 A random encounter that once again ended in Russian hospitality -I think you just have to be open to it. It’s easy to become insular when you’re in your vehicle with your home on your back, but that’s not the immersion experience we are after! After a truly enjoyable few hours we were on our way once again. Some distance south we noticed some people ice fishing out on the lake and another stop was imminent! We wandered clumsily some hundred or so metres onto the frozen ice and as we approached I could just imagine the lone fisherman sitting there thinking “bugger off and leave me to enjoy my day off!” Another quick strastvootjya, we don’t speak Russian and Australia and the same thing all over again. Offers of Chai (Tea) from his thermos and lessons in ice fishing began. After our teacher caught a few of my previously ingested Harigos we said our goodbyes and were pointed in the right direction to make sure we would make it back to the shoreline without drowning by our now giggling fishing instructor whom I think was amazed we made it back without requiring rescue! Our visit to Lake Baikal lasted longer than we anticipated as the scenery was just too good to rush but we now find ourselves back in Ulan Ude relaxing in the Menshikov Hotel – a great little find in the city centre that suited our needs perfectly with secure parking, wifi and, after some sign language with the lovely receptionist who spoke little English, an opportunity to do some much needed washing! A great little Italian restaurant next door was an added bonus and after my fishy experiences I thought I deserved a night off! This morning we left the hotel to lodge our Mongolian visa application at the consulate and we were greeted by light snow falling! 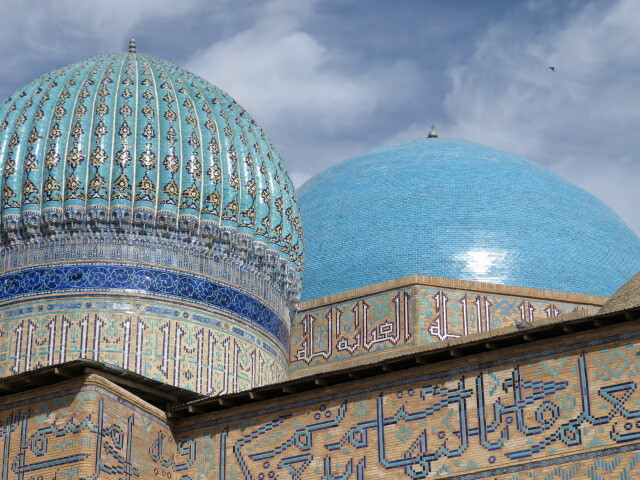 Visas ready this afternoon then onward to Mongolia!! Thanks for the comments and back soon – Justin. This entry was posted in general, Russia on May 12, 2014 by Jen. Monday and Yuri is on the phone – the container has arrived! Although we were ultra keen to pick up our Patrol, the week had been filled with sightseeing and relaxation that took the edge off the delay. 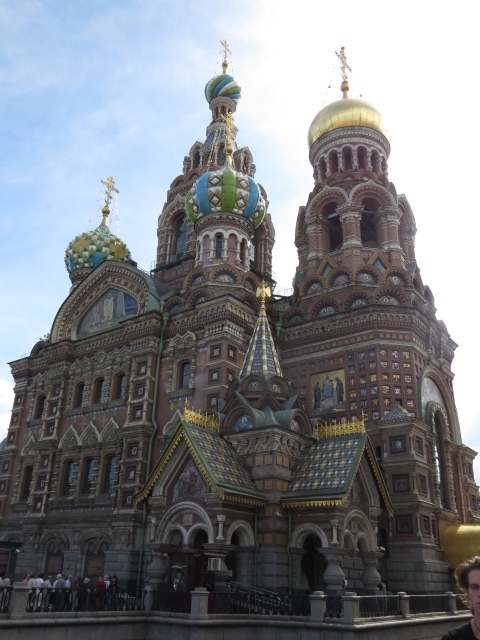 Another trip over the spectacular Golden Horn and Russky Island bridges with Vladimir’s colleague Stanislav, who showed us around Russky Island, proved to be one of the week’s highlights. There are a series of gun emplacements dating from WWI through to more recent fortifications peppered around the island and generally they are ripe for a side trip. No signs restricting access and if you have a good torch there is a myriad of tunnels to be explored. I have to give it to the Russians – unlike Australia they actually make you take responsibility for your own actions, get lost down there and it’s your fault. Imagine that! If you do something stupid you can’t blame someone else! I think I could run for office on that one alone! 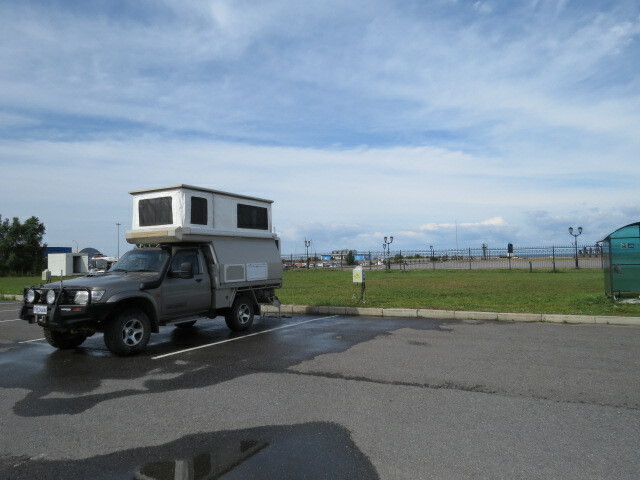 To my surprise, there were multiple locations on Russky Island where camping would not have been a problem and geographically its only about 20km from downtown Vladivostok! If we had a little more time I would definitely have recharged the batteries for a couple of days with views over the ocean! By now we were chomping at the bit to get moving. There wasn’t much of Vladivostok we hadn’t seen and I could now say cucumber in Russian with nothing short of a pure Russian accent (Oguriat) Anyway, that’s another story! 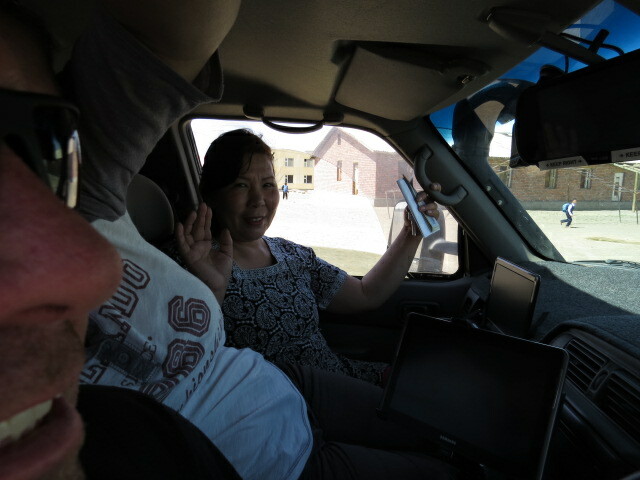 Wednesday morning, Yuri picked us up and we headed to the shipping and customs offices to sort out the import paperwork. En-route, I mentioned that I had seen 6 car accidents since arriving and shortly after this Yuri said make it 7 – yep there was another one! Shipping sorted and 3 signatures at customs were all that stood between us and the road! Piece of cake I hear you say. It’s an unusual situation when you find yourself in a government office not knowing what is going on and just nodding and also tricky to remember that Russians don’t smile!! 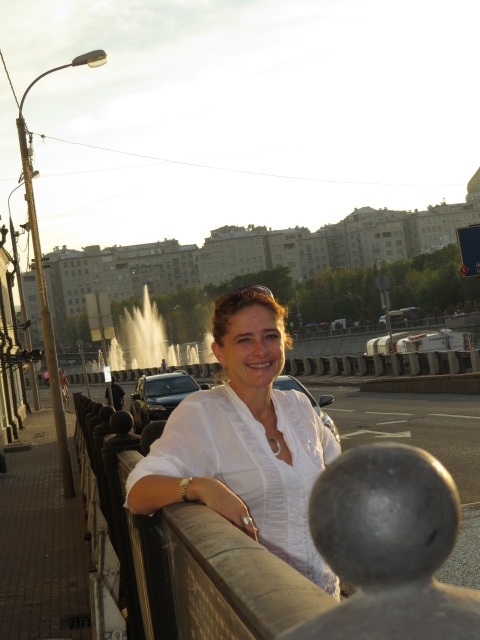 To quote Svetlana, Yuri’s ever-efficient associate – “Only fool smiles without reason”. Hmmm there are a lot of fools in Australia then…. Yuri returns with 2 signatures, one remains to be collected! Tick-tock goes the clock and I’m thinking we are nearly there! A tall woman (well, when your wearing 4 inch heals attached to leopard print knee high boots and touting a beehive haircut like something from the movie Grease you will look taller than those around you!) came out of an office in tears and walked past us. Yuri promptly appeared from the office and relayed that the lady in the boots was the customs inspection officer and she was having a bad day and would be unable to assist us, we would have to come back tomorrow! After nearly a week of shipping delays I was getting a little frustrated at this point and wasn’t overly enthralled with this further delay. It was at this point I noticed the little red box on the wall that read, in Russian of course, “break glass in case of emergency” I considered following the instructions if only momentarily just to see what the reaction might be. 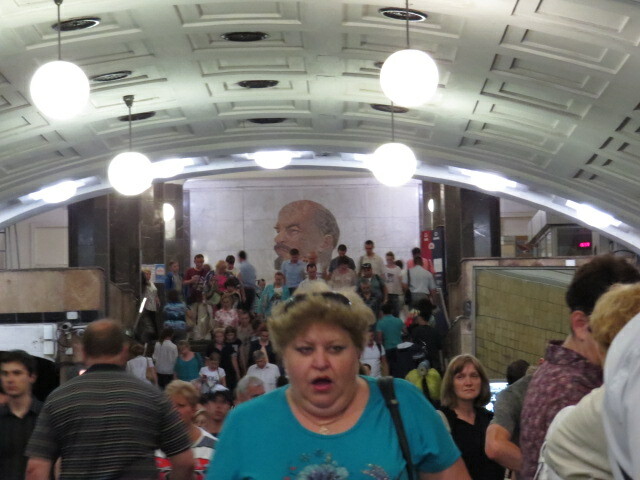 Alas, sanity prevailed and with an appropriately stiff Russian face I followed our small party out of the building for another day of sightseeing! 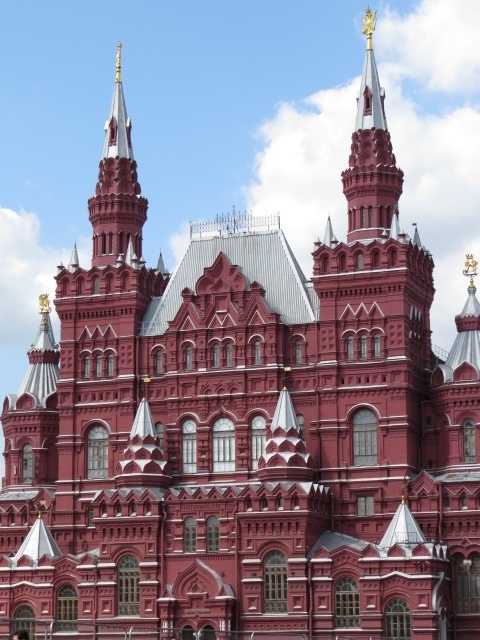 I must give credit where due, Yuri and Svetlana have both been professional and friendly towards us in all our dealings, always well organized and never too busy to assist. If your going to bring your vehicle into or out of Vladivostok then Links Ltd would be an easy recommendation for me to make! The following day proved fruitful and after another trip to the customs building, the third and final signature was obtained. Friday morning and after 6 weeks in the container we were finally able to cut the locks and open the doors. 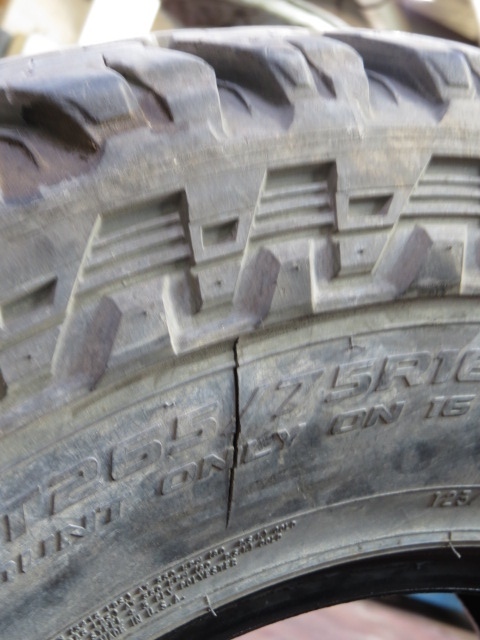 I was very relieved to find the Patrol in the same undamaged condition in which we had loaded it. Onto the streets of Vladivostok and I would describe this as fairly intense!! 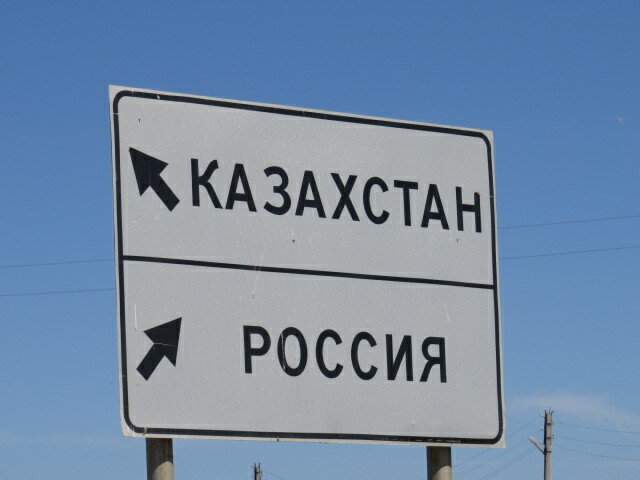 Driving on the opposite side of the road is one thing but when you add some heavy and slightly unpredictable Russian traffic into the mix it makes for a wide-eyed experience. After making it back to Vladimir’s apartment we were feeling a little more relaxed. The driving style seems erratic initially but once you get more used to it, generally it flows quite well but you still need to be on your guard! After parking the Patrol outside the apartment we went from being tourists to celebrities! Seems the vehicle was going to be a magnet for conversation. 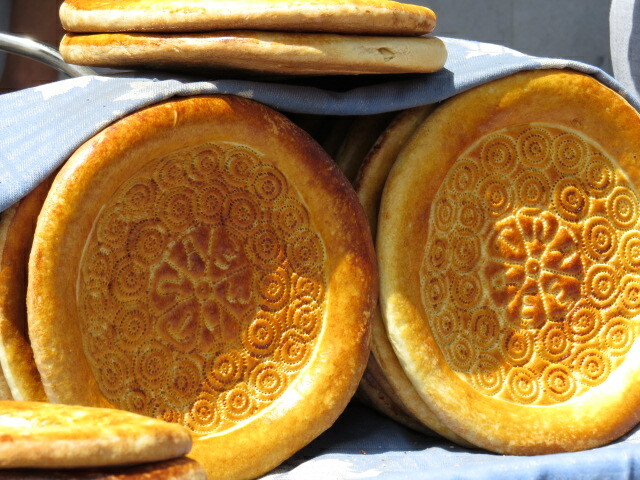 Ya ni gavaru parooski! (I don’t speak Russian) was fast becoming my new favourite phrase, however generally when we used the phrase the reaction seemed to be more questions in Russian. 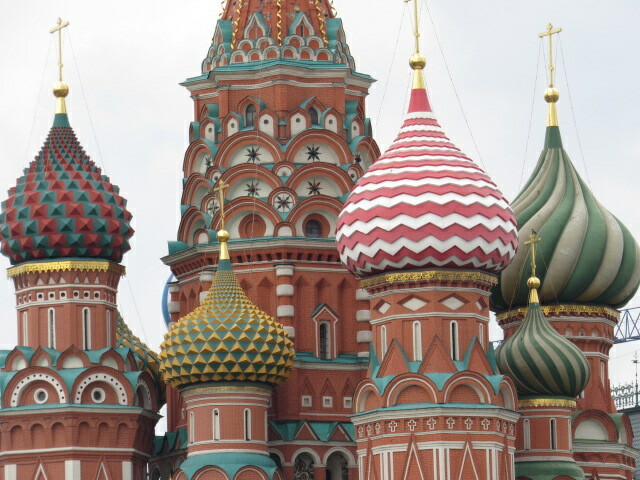 Maybe saying I don’t speak Russian in Russian clearly means you can speak Russian! 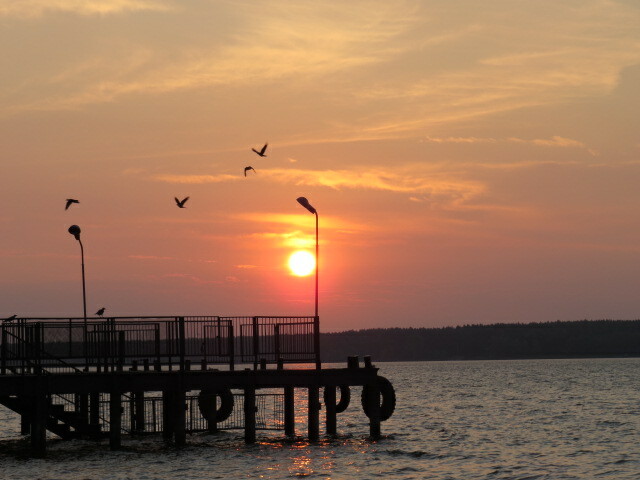 That evening was to be our last in Vladivostok and with a few beers and some snacks in tow, Vladimir took us on a short walk to a favourite spot which provided views over the hustle and bustle of suburban Russia! It was a warm and thoroughly enjoyable evening! 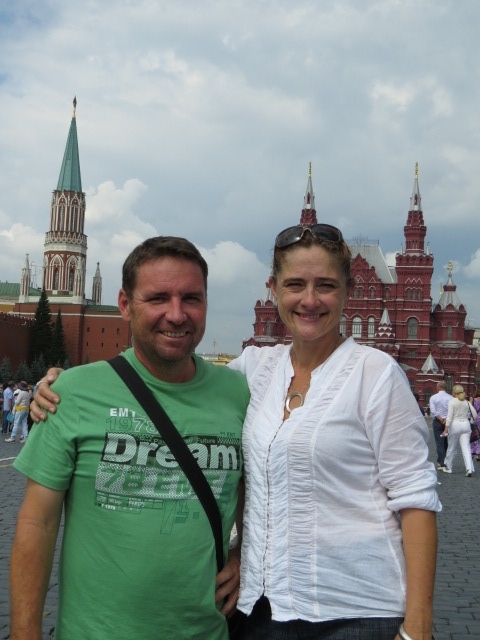 We cannot thank Vladimir and Nina enough for their hospitality towards us – such generous people! 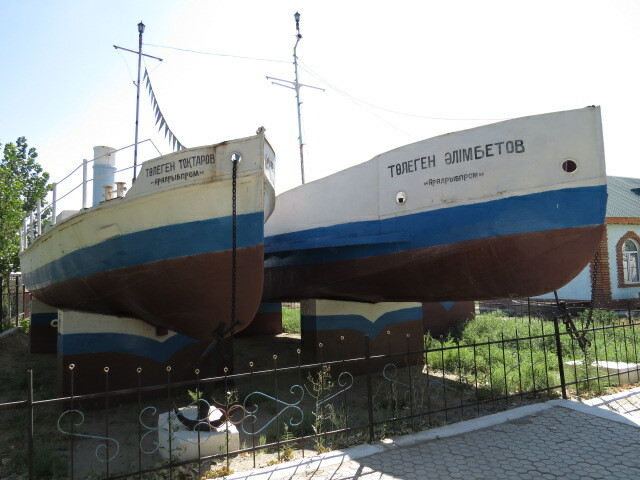 Saturday afternoon we headed to the southernmost point of the Vladivostok peninsula in convoy with Vladimir and Nina and after photos, hugs and farewells we set the trip-meter to zero and headed north! About 200km later we found ourselves camped along a power-line and all by ourselves. A bottle of red was enjoyed and during the next few hours the wind picked up, the rain came down, the lights of a distant town that had been visible early in the evening slowly dissolved into the gloom of the low cloud and I felt very excited about the adventure ahead. 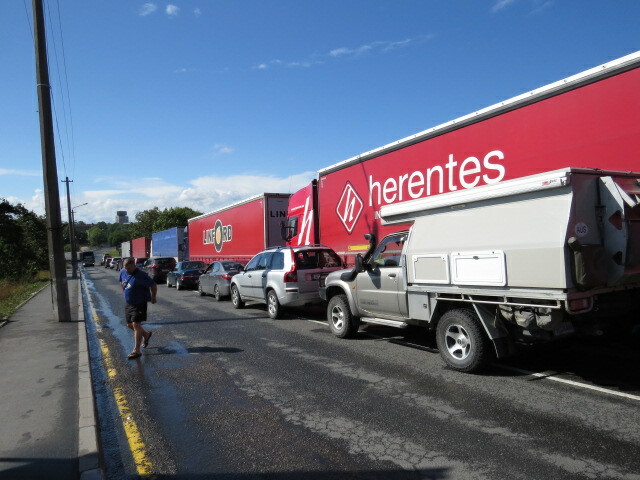 The next couple of days saw long stretches of road-works with what can only be described as chaotic overtaking. One lane each way of heavily corrugated and undulating gravel road that consisted of intensely impatient drivers risking all for that extra car length! Having said that, although impatient they are a courteous bunch and a flash of the hazard lights after overtaking lets you know that they appreciate you moving over to help them pass. Our next couple of days saw fairly heavy rain but with nice sunny breaks in-between. 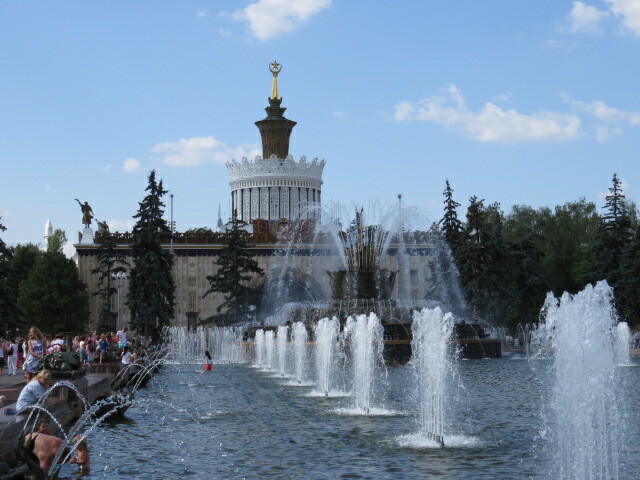 800km from Vladivostok saw us arrive in Khabarovsk, a city of 600,000 people who were all on the road to greet us. That’s what it felt like after a few days of fairly straight forward highway driving and all of sudden it was back to the hectic style of Russian city driving. Khabarovsk at its outskirts seemed a little run down and tired with electric trams that I thought were abandoned relics of a bygone era until I saw passengers in them. 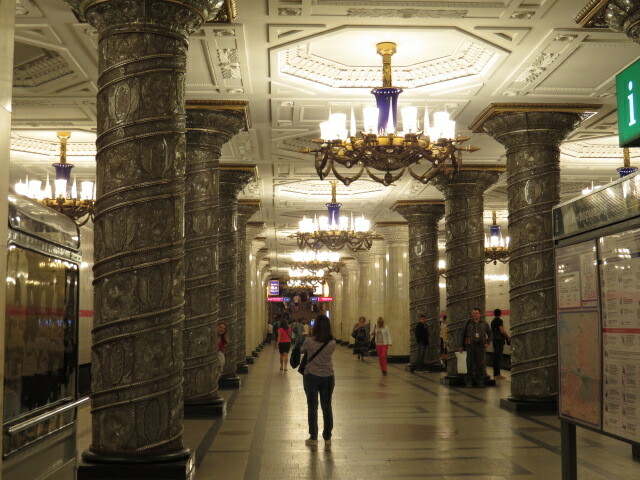 Central Khabarovsk however was a different story. A lovely riverfront promenade with picturesque parklands and a main city square reminiscent of many European cities was a pleasant surprise. A noticeable lack of litter was also a positive! 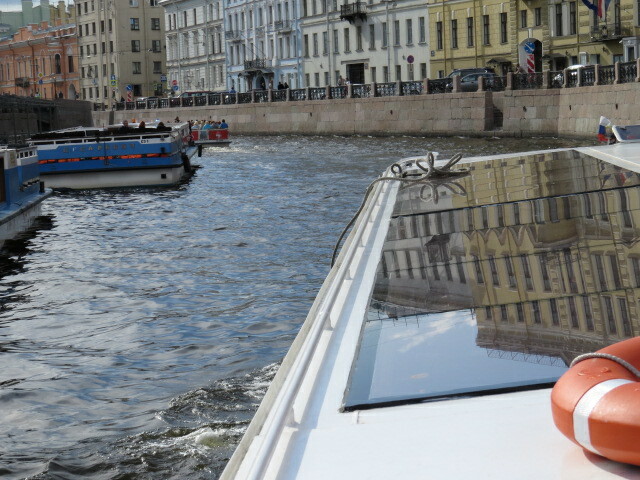 Littering it seems is a popular pastime for some Russians and is a source of national embarrassment for the rest. On our travels north from Vladivostok it seemed that any side road taken for a quick pitstop served as a secluded location ideal for the dumping of bulk rubbish by locals – something that the authorities are trying to combat. 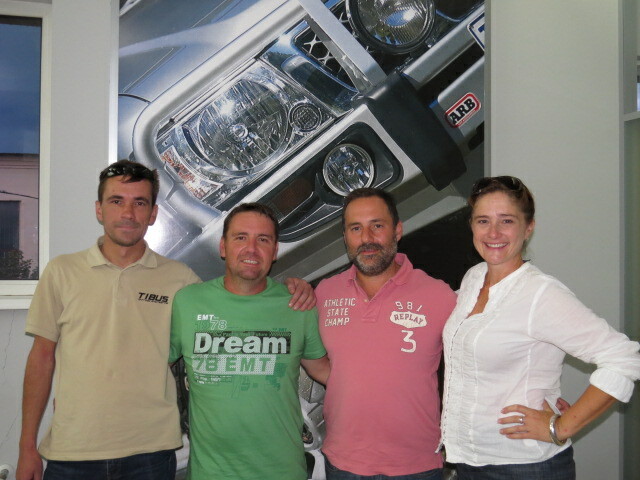 We found our way to the Platinum Arena near the city centre and here we were met by Eugeney and Vitali, the latter having just completed a 6 month round the world tour in his Land Cruiser 78 series with family in tow! 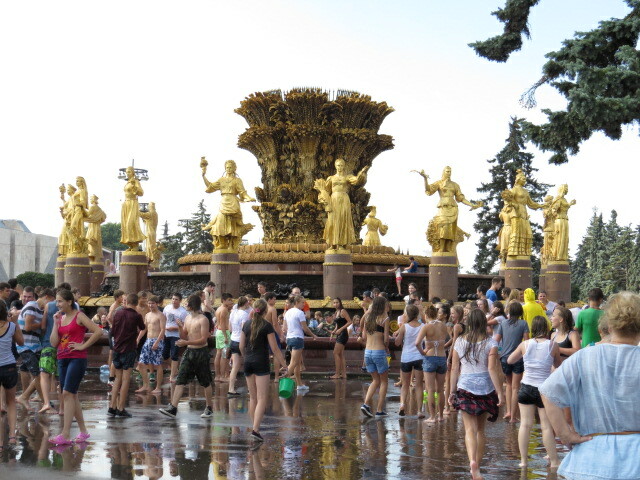 Once again we were about to be soaked in Russian hospitality. We piled into Eugeney’s VW Toureg and were promptly treated to a fantastic meal at what turned out to be his restaurant – Senore Pomidor! 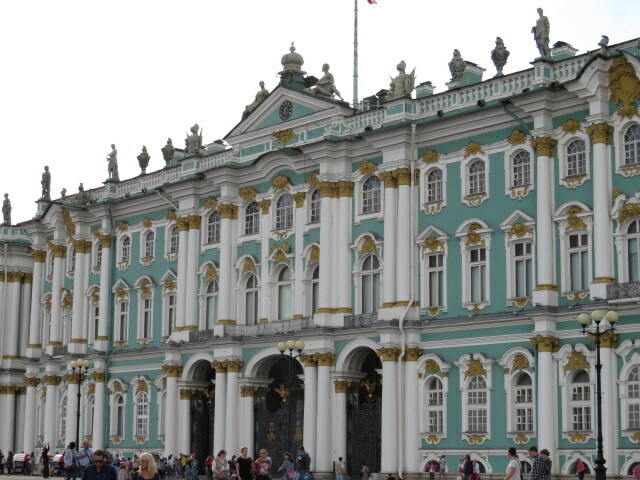 A city tour followed and then the offer of a night’s accommodation in Eugeney’s palatial villa! Another fantastic evening had slipped by in record time. 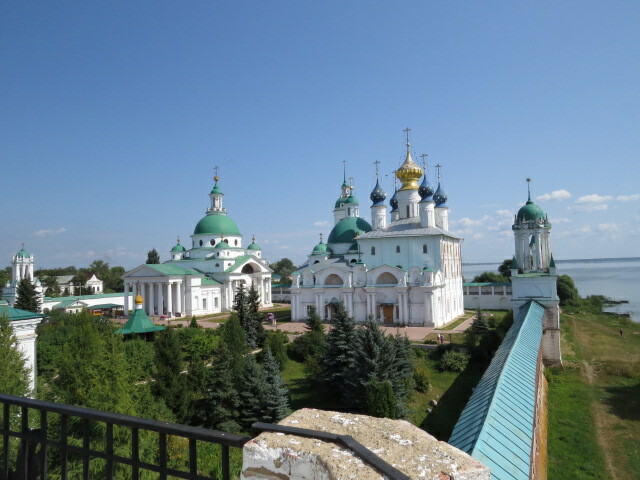 The following morning saw Vitali’s wife Galena pick us up and we headed for the Khabarovsk museum. I know that doesn’t sound too riveting but it turned out to be absolutely sensational and I felt fortunate not to have missed it! 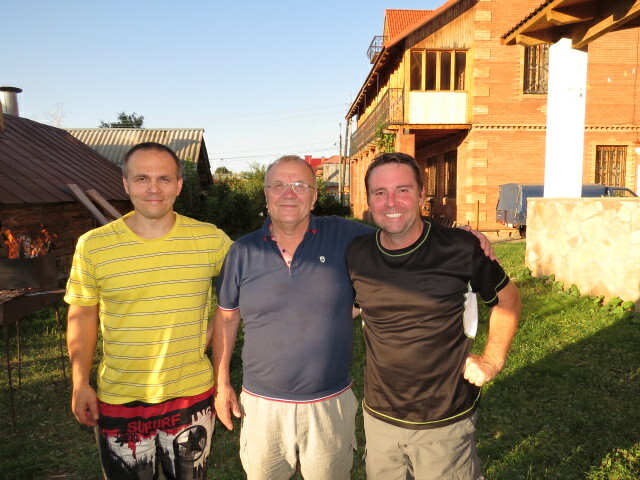 Back to their apartment and we met up with Vitali for a lunch of Borsch (soup) which was delicious! 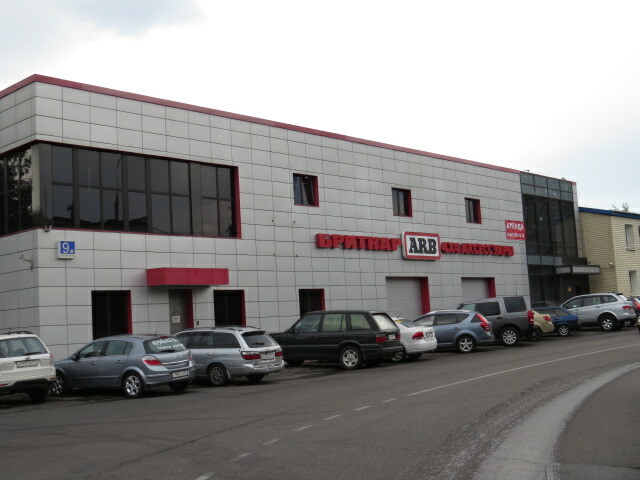 Vitali has a 4×4 shop in Khabarovsk! 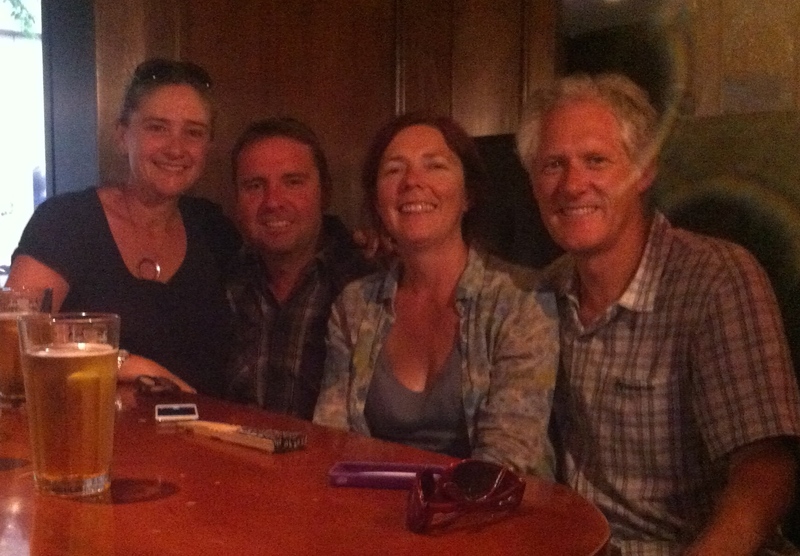 A discussion about our plans and a look at some exquisite photo’s from there round the world sojourn topped of the day. 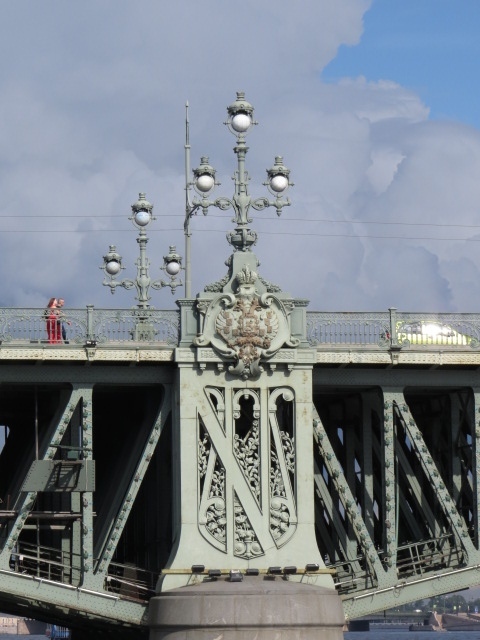 Their daughter Katia returned home from school around 3pm and we all headed of for some views of the bridge over the Amur River! The supermarket followed and we were pampered by Katia as she helped us to navigate the Cyrillic labels, I’m sure they all had better things to be doing than following us around while we food shopped but the generosity of these people once again amazed us. Goodbye’s again and we were heading west! 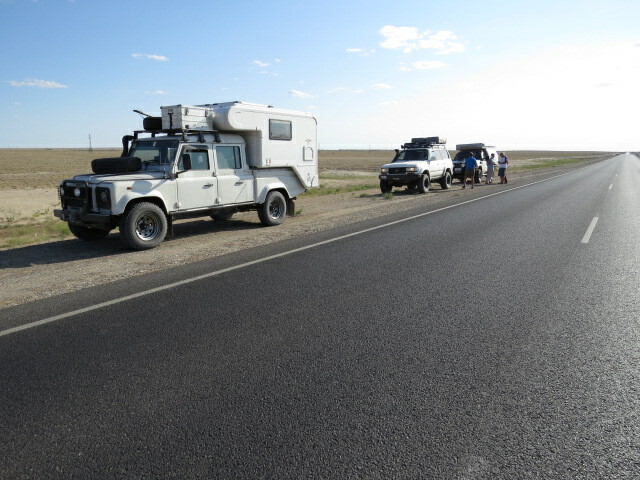 As we travelled onwards from Khabarovsk towards Chita we began to look for a home for the evening and settled on a site near some marshland a few kms from the road as our night’s camp. Mosquitoes automatically accompany terrain like this but the sunset was magnificent and you would have been forgiven for thinking that we were camped in an African savannah. 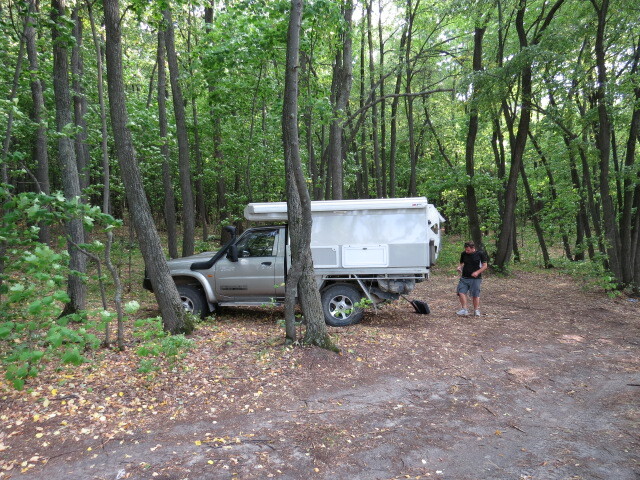 Saw our first Russian wildlife in the form of a small squirrel as we navigated the boggy road back out to the highway. Later, when the elevation increased, so did the occurrence of ice along many waterways. As always, you discover the best campsites when you don’t need one and we found a burster alongside a river but later when we needed one it proved quite difficult and we finally settled on a track that looked like it’s most recent use had been the transit of cows. 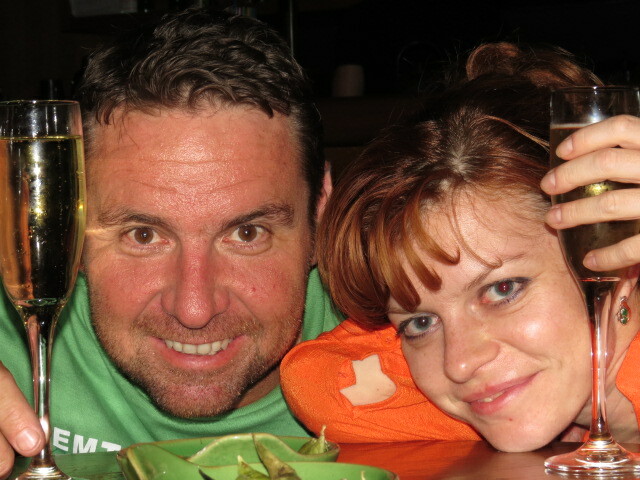 Settling in, we had dinner and a few drinks when the silence was broken by the sound of a motorcycle approaching. 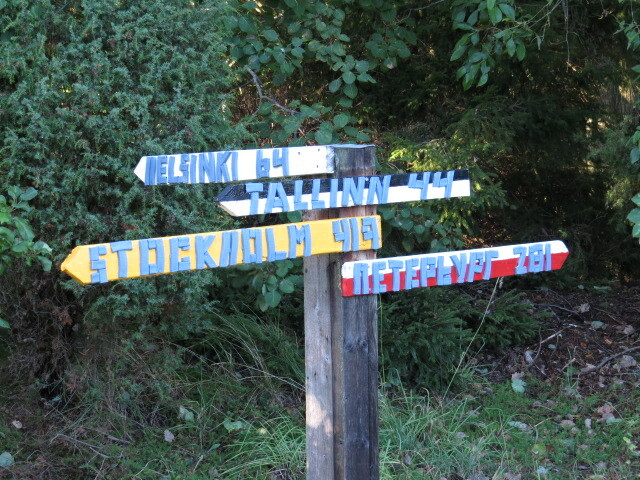 Now let me clarify that it was a dark night, about 10.30pm and we were on a disused track off a dirt road. Passing within 6 inches of our car down the track was the first Russian motorcycle ever built complete with sidecar and no lighting whatsoever! No surprise then to discover that the bike and rider had then proceeded to crash into a rut in the track 2 feet deep which brought the screaming jalopy to a halt and silence again returned. 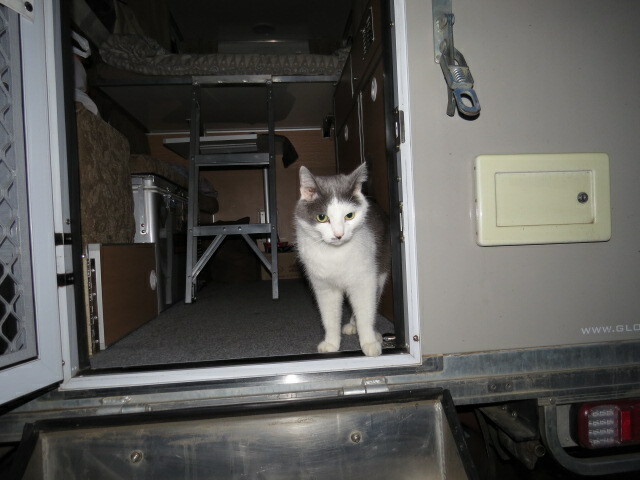 Moments later a young Russian appeared from the darkness at the rear of our camper and despite no common communication territory it was evident he was seeking help. Justin first disappeared into the darkness with him armed only with a Maglite and then summoned my assistance also. A few good tugs and the bike was free but it wouldn’t start. Mobile phone coverage in Russia is excellent and no sooner than our Russian had made the call, reinforcements in the ever popular camouflage clothing appeared. We were a little nervous that the hill folk now knew our location but they seemed harmless enough and in time they disappeared into the night with the motorcycle and peace and tranquillity returned. One thing that has been a stand out observation as we have been travelling through many small towns is the popular choice of roof and fence colour. It seems as though” Home Hardware” must have over ordered colorbond and paint in their trademark blue and sent the oversupply to Russia! Camping for the last few nights in altitudes around 2500ft has tested out our setup with the mercury dropping to -10°C overnight. Water pipes and taps frozen in the morning mean that without forward planning the night before, morning coffee has to be abandoned and this is unthinkable! We are ever thankful for our wonderfully warm down quilt and find ourselves quite cosy at night despite the below freezing outside temperatures! However one thing that we weren’t quite prepared for was the adjustment or lack thereof to our internal body clock. Something tells us that the time zones are not quite right when you are on the same longitude as Perth but are experiencing a springtime sunset of 10pm without daylight saving and total darkness only achieved at about 11pm. I cannot fathom what time the sun will be setting in the middle of Summer!! Sunrise also seems to be out of adjustment and is rising much later than one would expect for Spring. What seems like late afternoon to us is in fact 8pm and we haven’t even camped yet. Before we know it midnight is upon us and we have only just finished dinner. 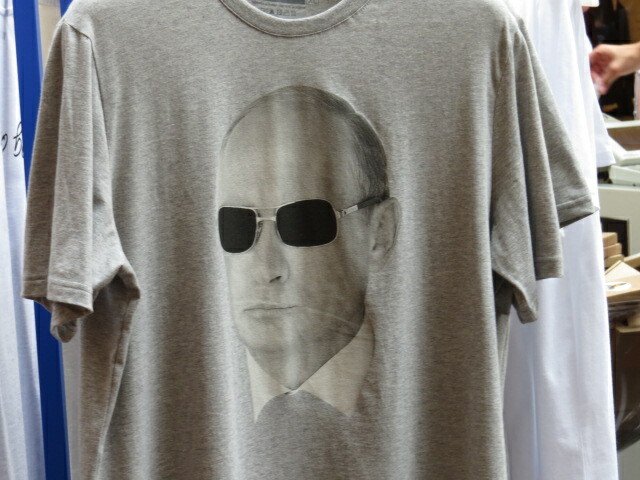 Nearly three weeks in Russia and this is still something we cannot quite adjust to! Since when is the sun NOT directly overhead at midday? 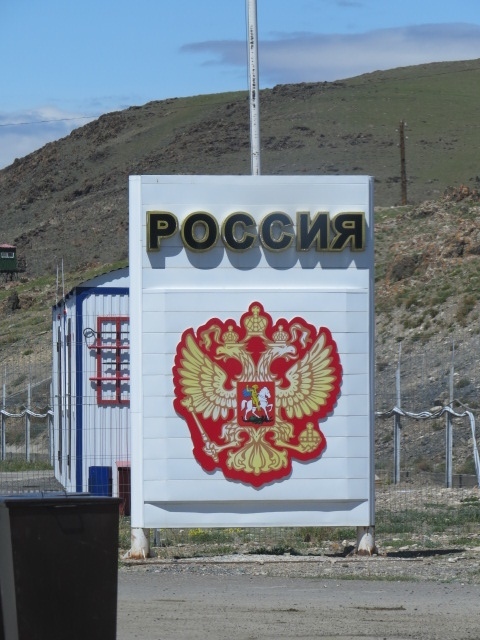 Onwards to Chita and there has been much bad publicity about overland travellers being the targets of criminal activity in this area. Not overly filled with confidence, we opted to get in and get out with only the necessary stop at the supermarket on the agenda. 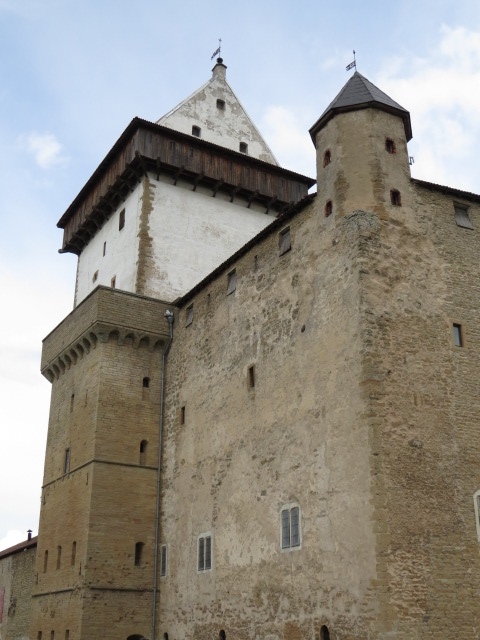 The entry to town was ramshackle and unattractive to say the least and the drivers seemed a little more erratic. Supermarket found we went inside for what we always find to be an adventure as we decipher the Cyrillic characters on packaging to try and guess what it is we are about to consume. On departing the supermarket, we found a man nearby the car wanting to ask questions of our vehicle and this time Ya ni gavaru pa rooskie worked and sign language, the names of the Russian Cities we had been through and Australia seemed to provide him with the necessary information. Aklishna (excellent) was his response and upon turning back to the car, encountered another 2 men wanting to chat. One obviously understood some English but hadn’t the confidence to try and speak it so resorted to translating my comments about our journey to his friend. Armed with bottles of Vodka in their pockets and lovely gold teeth they seemed impressed with our setup and were content to be on their way. 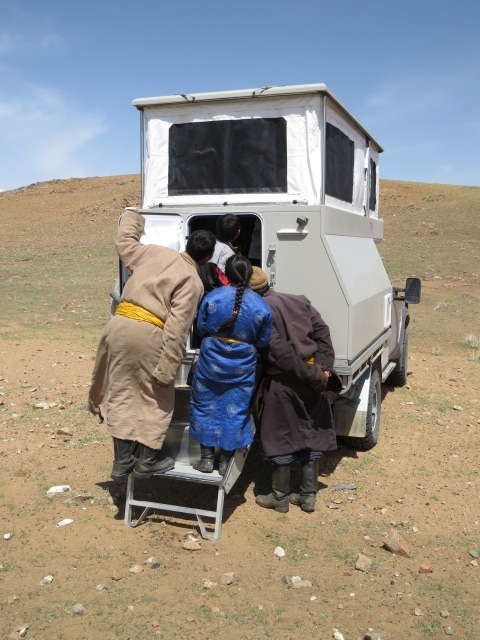 These experiences did much to lift our impression of Chita and hope that maybe this is indicative of good things to come for this overland transit point. 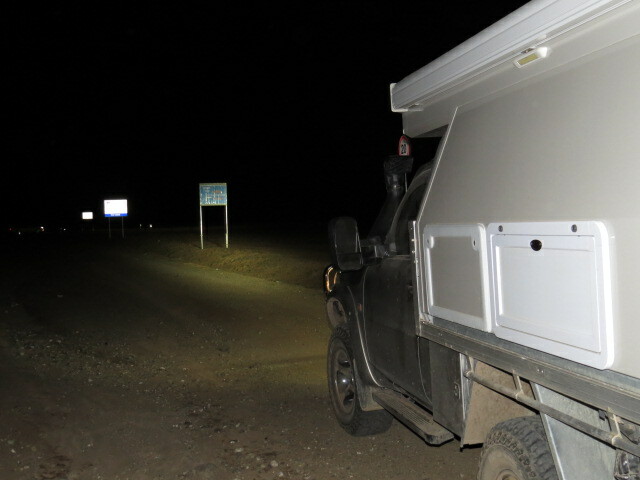 We headed for the nights camp 140km west of Chita en-route to Ulan Ude for another sub zero night. 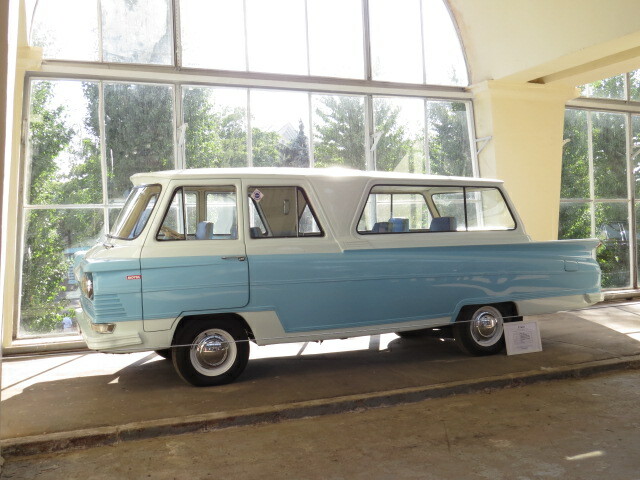 This entry was posted in general, Russia, Vehicle on May 5, 2014 by Jen. Apologies to everyone, it’s been a long time between post’s and much has happened, I won’t bore you with the details but instead try and dazzle you with the highlights!! A quick overnight stop in Incheon South Korea en route to Russia proved really enjoyable. A relaxing stroll through quiet suburbs followed by a traditional Korean BBQ restaurant. Always nice when you’re the only one in a restaurant who seems to suffer from a speech disorder – making sounds that nobody understands. But after much finger pointing, laughing and some hand signals we left well fed and happy! Aeroflot to Vladivostok and waiting for us at the airport was our internet compadre Vladimir! We had been in contact some months ago via the Expedition Portal website. Vladimir and his wife Nina have previously met other international travellers, I think they may become a Vladivostok institution! 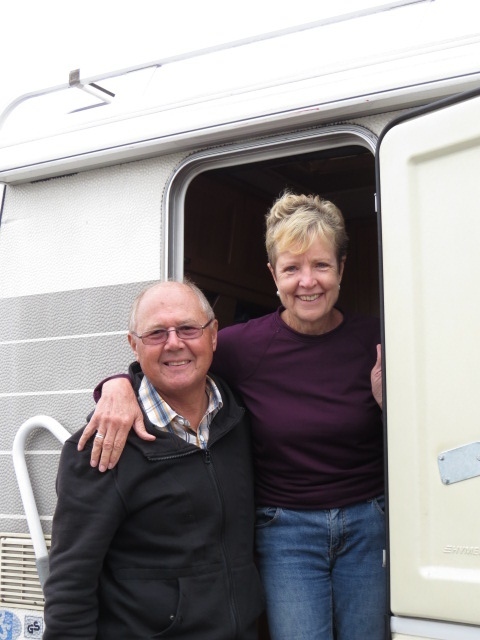 If you have the chance to avail yourself of their hospitality when travelling overland, then make it quick as shortly they are off in their Nissan Safari across the Stans to Europe, the USA and South America. 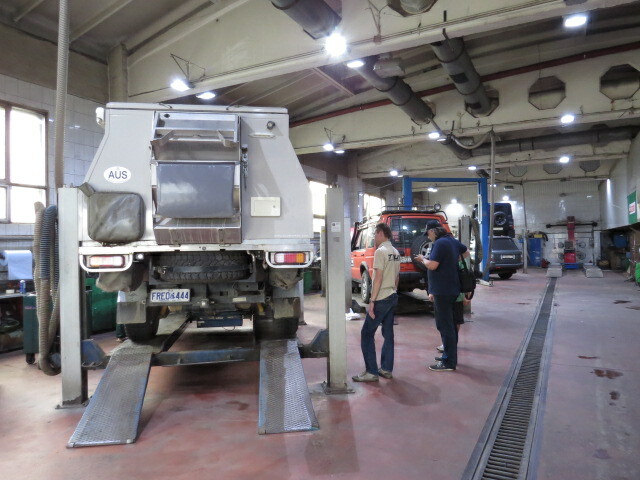 Our first lesson from Vladimir was purchasing fuel, hmmm it’s going to be tricky but we will work it out. Finally to our Hotel for a well needed freshen up. An elderly naked woman moving about in the apartment opposite from our hotel room proved an interesting introduction! Day 2 in Russia was met with some disappointment, our Russian shipping agent Yuri from Links Ltd, advised us that it would seem our Patrol had decided to spend some time sight-seeing Korea on it’s own! I had a suspicion that something was amiss as we had been tracking the container on the net! Vladimir, Yuri and some of Vladimir’s friends lifted our spirits with a lovely evening at a local restaurant including many pints of amber ale and an attempt at a vodka lime & soda. On this point I must elaborate! In a country built on vodka we didn’t realise it is only ever consumed straight! As Jen is a fan of her mixed spirit beverages, she thought she would persevere in ordering this apparently alien concoction. Now with 4 Russian speaking translators for us at the table we thought we had it right, however as the return visits to our table from our waitress increased in regularity and discussions in Russian became faster and louder we were not so convinced. Example – what ratio vodka to soda, answer 20% to 80%. I had to feel for the waitress when finally a shooter glass of vodka arrived with a separate glass 1/3 full with bi-carb soda! Much laughter erupted from our table when Jen explained that soda water is similar to tonic water. Sprite was subsequently delivered (close enough), an apologetic thank you to our waitress and Russian – Australian relations returned to equilibrium! 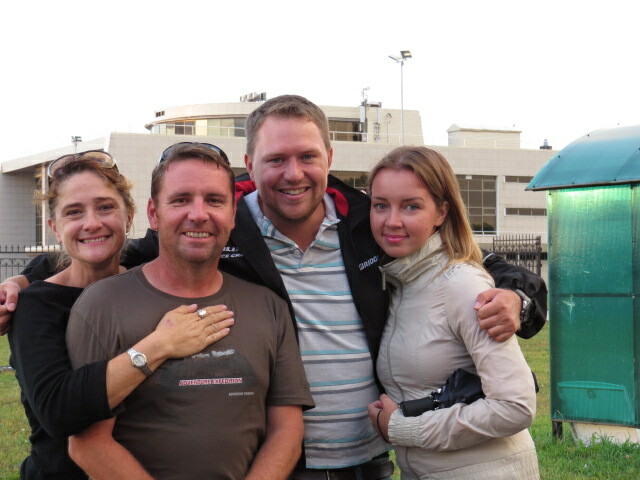 At this point after leaving the hotel, Vladimir and his wife Nina have chosen to look after us like family, and I mean family! We are staying with them in their apartment in Vladivostok and have been overwhelmed with Russian hospitality and generosity not only by them but by their friends also. 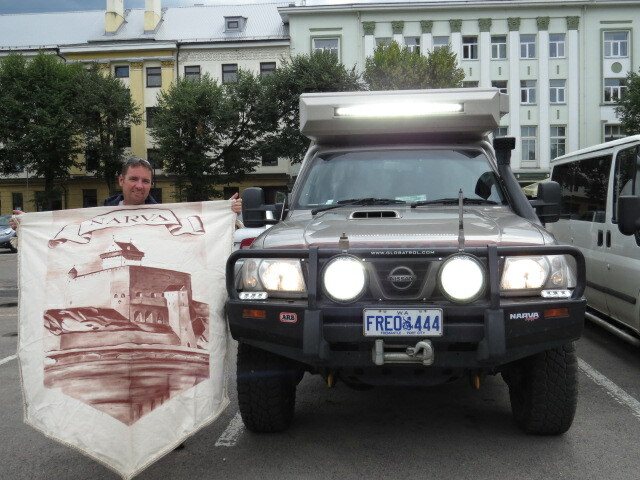 Prior to leaving Australia Vladimir had mentioned to me that his 4×4 club “Off Road Club Ussuriysk” were organising an event on the Saturday, no need to be asked twice. Friday it was into the Safari and 100km north to the event location, apparently we were to assist in setting up the event. 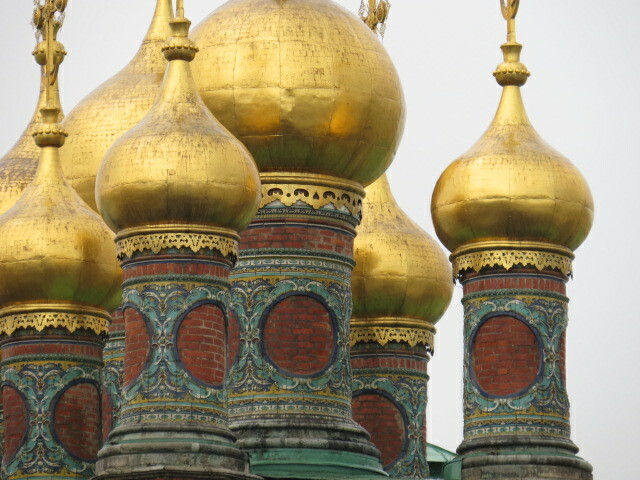 However the ever hospitable Russians had other plans! 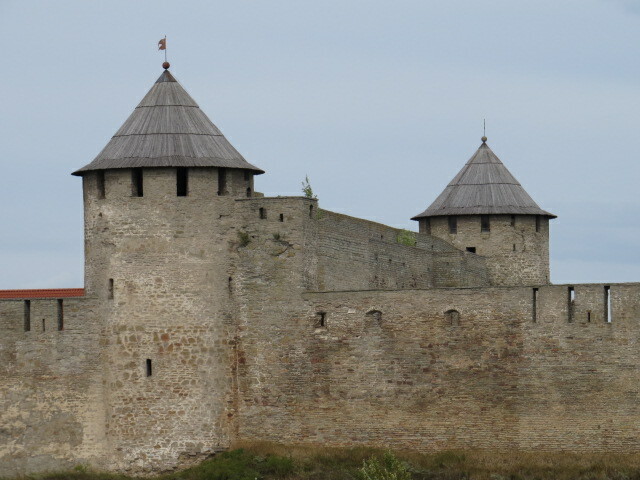 The competition is to be held on private land owned by Sergey whom is also in the process of developing an archaeological site into a tourist attraction. 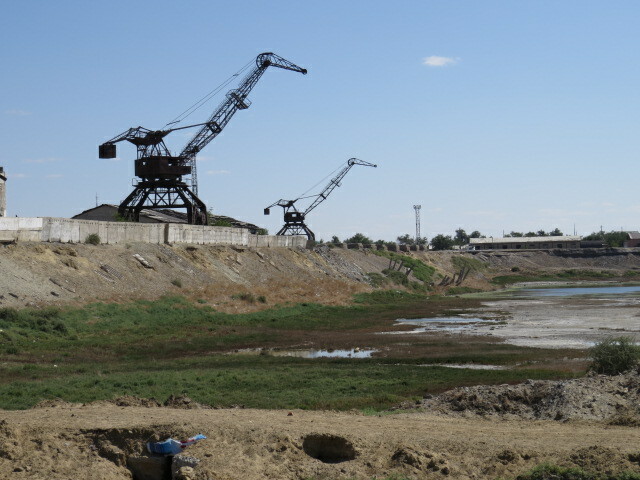 Known as Emerald Valley – www.dvpark.ru. In a lovely gesture we were asked to plant some Birch trees in the Park as a symbol of our visit to Russia, a fantastic idea and now 8 birch trees commemorate our trip and will soon have a plaque with our names! 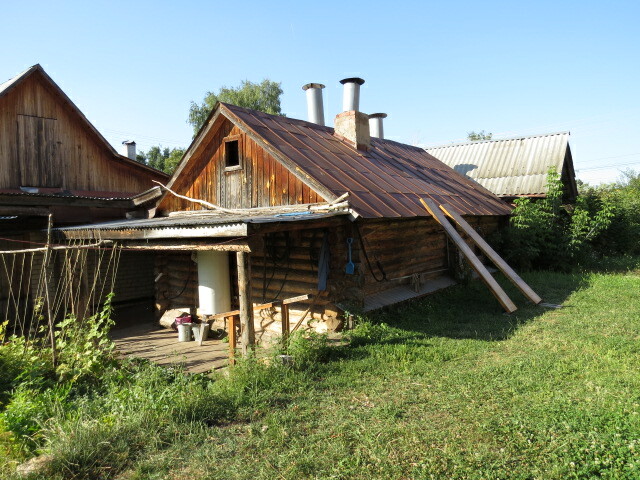 Initially we were to be camping but Sergey would not hear of it so it was off to his large home in Ussuriysk, a 2 storey home full of rooms and the now unmistakable Russian generosity! Of course the 2 litres of vodka that disappeared over the next few hours is another story. My only comment on this is that Jen will have to write that post as I can’t remember anything!! Up early and off to the competition,5 clubs and over 30 vehicles of all sorts and sizes with a myriad of modifications! Suzuki Jimny’s are a favourite here and when fitted with 40 inch tyres and Prado axles and maybe a few vodka’s they are fantastic to watch! 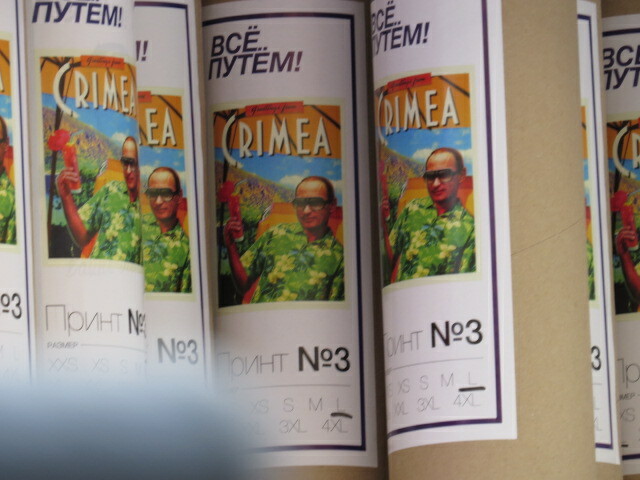 The stages progressed over the day and I had to make a concerted effort to avoid more vodka consumption! 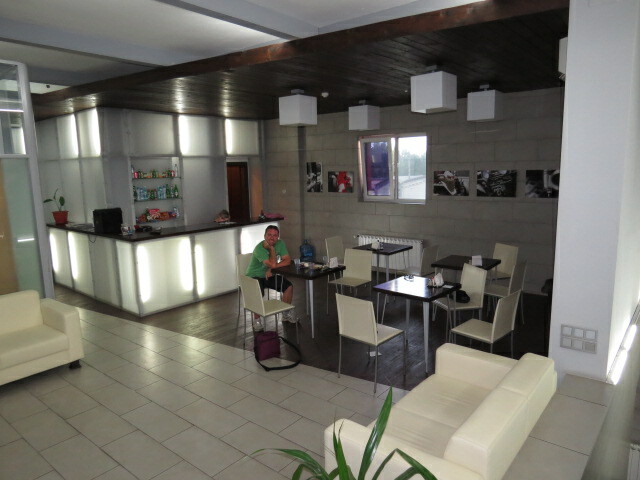 Jen seemed more than happy to enjoy a small shooter and slide onto the back of a quad bike driven by a six year old cart racing champion – we do have travel insurance! After a long and enjoyable day I was informed that it would be lovely if I was to say few words at the presentations, wasn’t expecting that but with a dose of Malatsi (strength) I took the microphone and did my little bit for international relations! I think it was received well although as I write this there is a Mig fighter jet flying around overhead hmmmm! 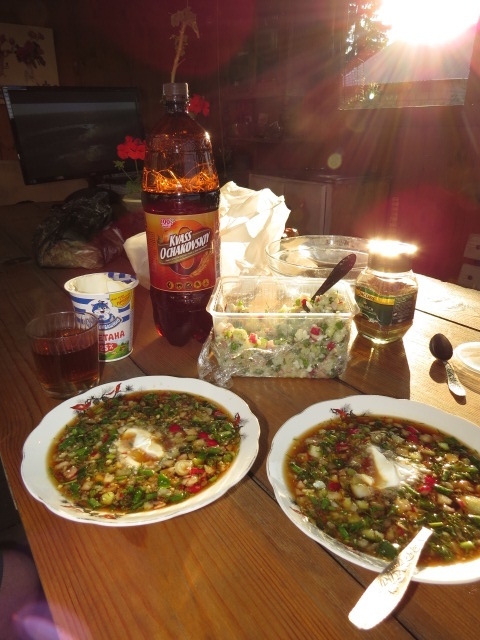 Back to Vladivostok and a lovely meal prepared for us all by Nina! Smoked Smelt fish, Smoked Salmon, Fried Navaga fish, potatoes and salad with beer!! Easter Sunday here is celebrated with a nice concentration of tradition! a breakfast of salami, cucumber, toast, cheese and boiled eggs was waiting for us. You hit the boiled eggs together before shelling them and place a dollop of caviar on top before eating! Takes a little getting used too! 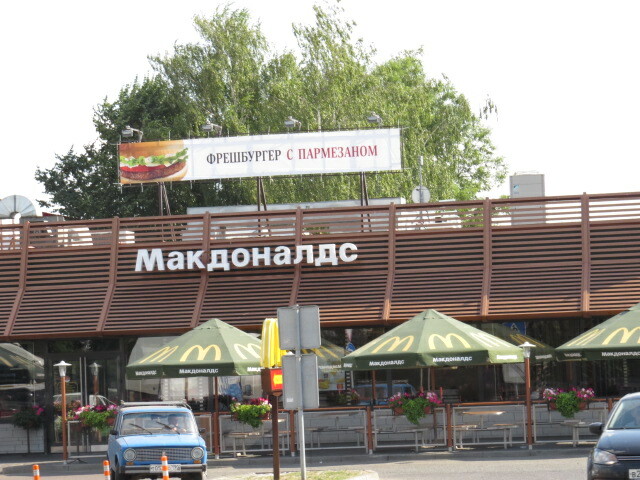 We have enjoyed all of the meals here in Russia so far, there are the expected differences. We are not so used to the style of smoked fish or the roe! You can always find something that works.. 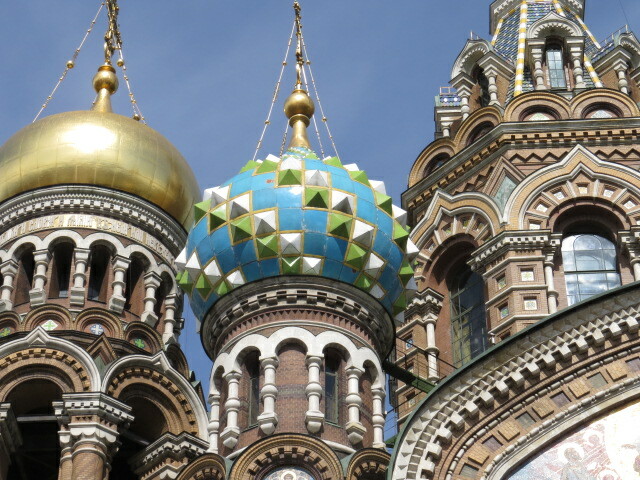 The Russian people have been overwhelmingly inviting and generous, the longer we are in the city the more I have been able to pick the nuances. 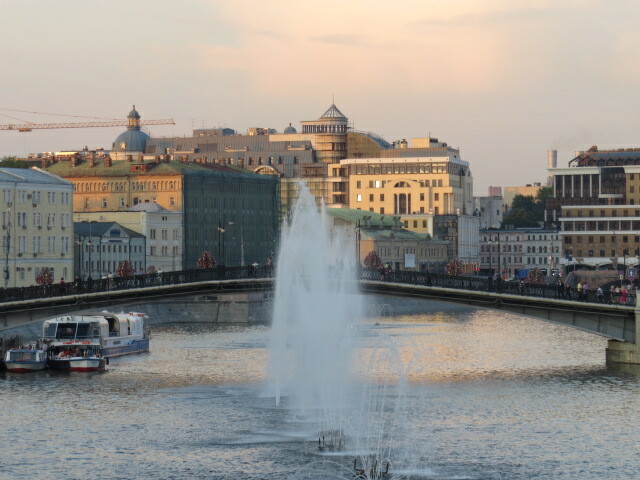 When you pass by in the street there is rarely a twitch of expression and watching Russians talking to each other you would not be out of order in thinking they were arguing quite fiercely! But this is generally just our perception, it is just the way they interact! They warm up so quickly once you are past the first awkwardness and then light up with smiles and handshakes. Easter Sunday evening was capped off with a visit to friends of Vladimir and Nina’s in Vladivostok central, a lovely apartment overlooking the harbour. Treated as long lost family will set the scene! 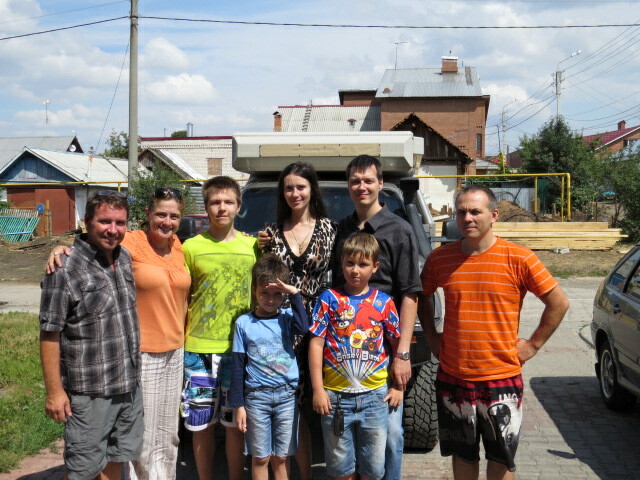 Igor, Galeena and their daughters Leeyanah, Jenya, an Alyssa were to provide another injection of Russian Hospitality. A wonderful meal and home backed Easter Cake, washed down with Birch tree water harvested by Igor himself and of course vodka and liqueur. No need to have a dry night! The evening was capped off when Igor realised we had not yet been over the 2 bridges that catch your eye from almost anywhere in Vladivostok, so in to the car and off to Russky Island. 6 degrees C and 70kms per hour and there is Jen with her head out of the sunroof taking photo’s – only in Russia! This morning has provided the news we have been waiting for, our Patrol has arrived and will hopefully be released on Wednesday! We are very much missing it and the clothes and sundries within it – we are really stretching our wardrobe at this point! Hopefully we are on the road for the next update! This entry was posted in general, Russia on April 21, 2014 by Jen.